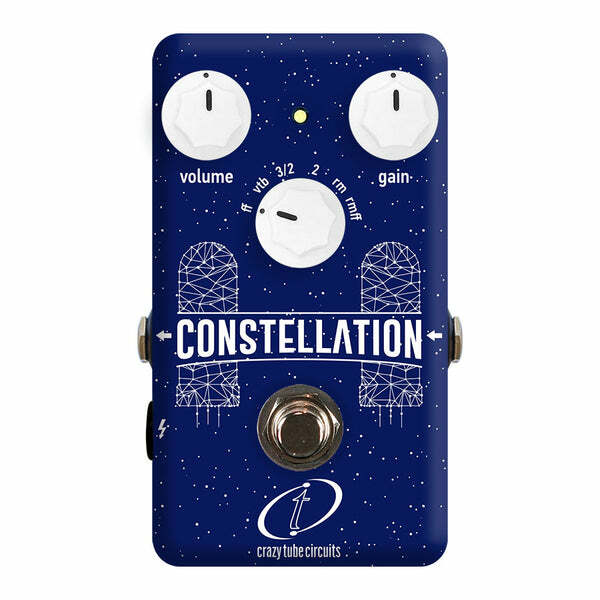 This is one of those pedals that comes in and we all get very excited to buy one. Most of us have more than enough drive pedals, but the way that this pedal responds both at low and high gain is addictive!! Check out our collection of Pedals! Small body guitars have become the instruments of choice by folk artists like the Milk Carton Kids, I’m With Her, Brandy Carlisle and more. These Traditionals are very comfortable to play and surprisingly loud and dynamic. This City Limit sounds huge while still being incredibly clear and focused. The sustain is unbelievable on this one, even at low volumes notes seem endless. Also if you show up in a t-shirt at a wedding you can just bring this guitar with you and everyone will still think you are classy! The bass and sustain on this Baritone is unlike anything I have heard before, totally what you would expect from a Collings guitar. Super fun. You'll find it a necessary extravagance after you give it a strum. 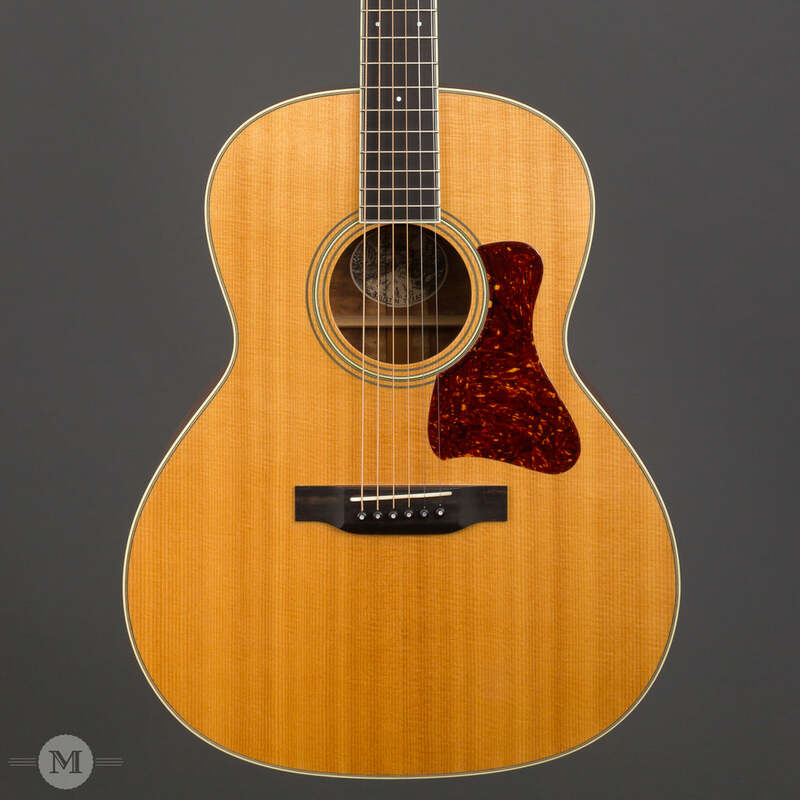 Check out our current collection of Collings Guitars. One of my favorite Collings builds. This Traditional model sports a 1 11/16" nut width, which fits my hand perfectly as I'm predominantly an electric player and more accustomed to a smaller neck profile. I can pick this guitar up and feel right at home with it. 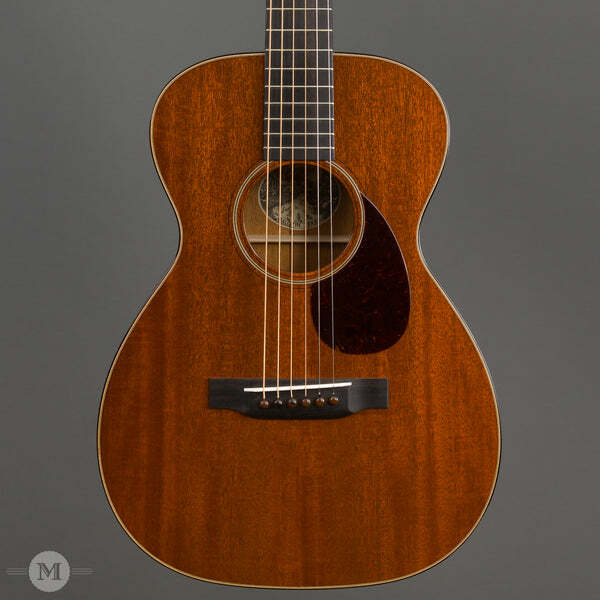 I've been very fortunate to have played a number of pre-war acoustics and these guitars are as close as you can get in a new instrument, hands down. 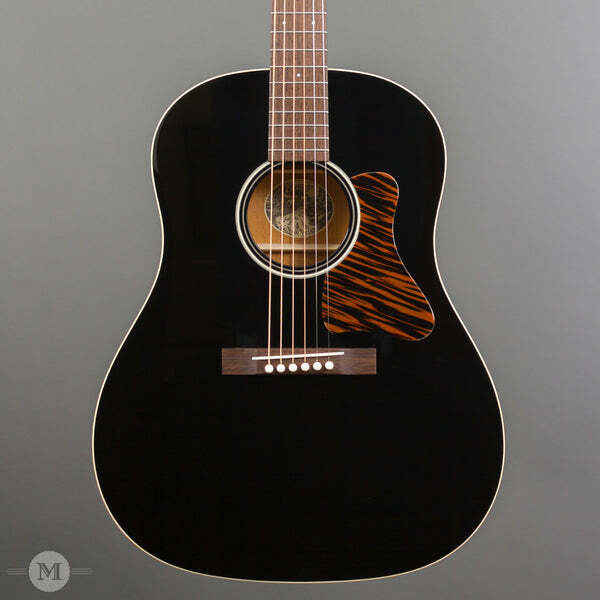 Check out our collection of in-stock Acoustic Guitars! This traditional Gypsy Jazz build delivers the classic brilliant trebles balanced by a tight clear bass end---all at an affordable price. The fret work is excellent and the neck shape modern and comfortable, making for an exceptionally enjoyable playing experience. Get your Django on! Simply the best knobs on a pedal, ever. This is a great banjo for someone looking for an inexpensive open back, starter, and/or travel banjo. Fully adjustable for a variety of play styles. Clawhammer is poppy when played over the neck and fingstyle is bright but full. 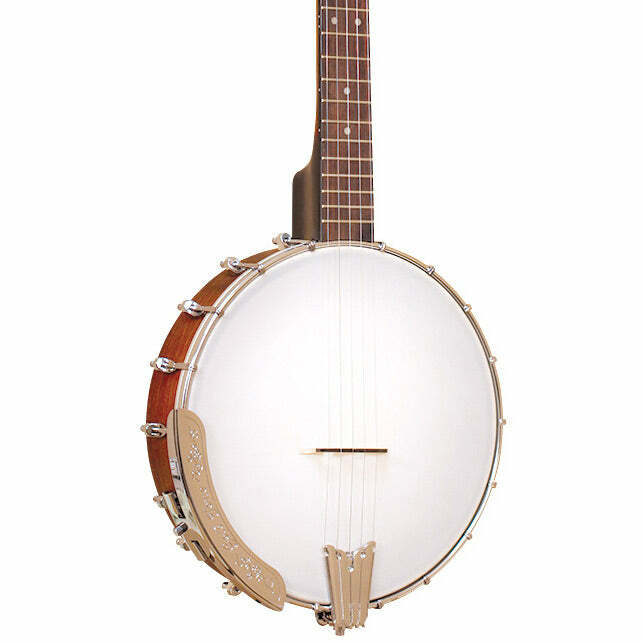 With a full setup in our shop these are fantastic playing and sounding banjos for a great price. Check out our Collection of Banjos! 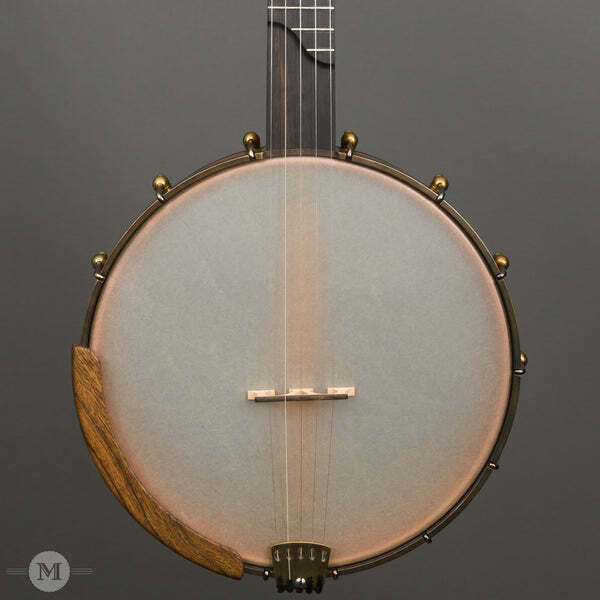 The Bart Reiter Regent is another quality banjo from this veteran builder. 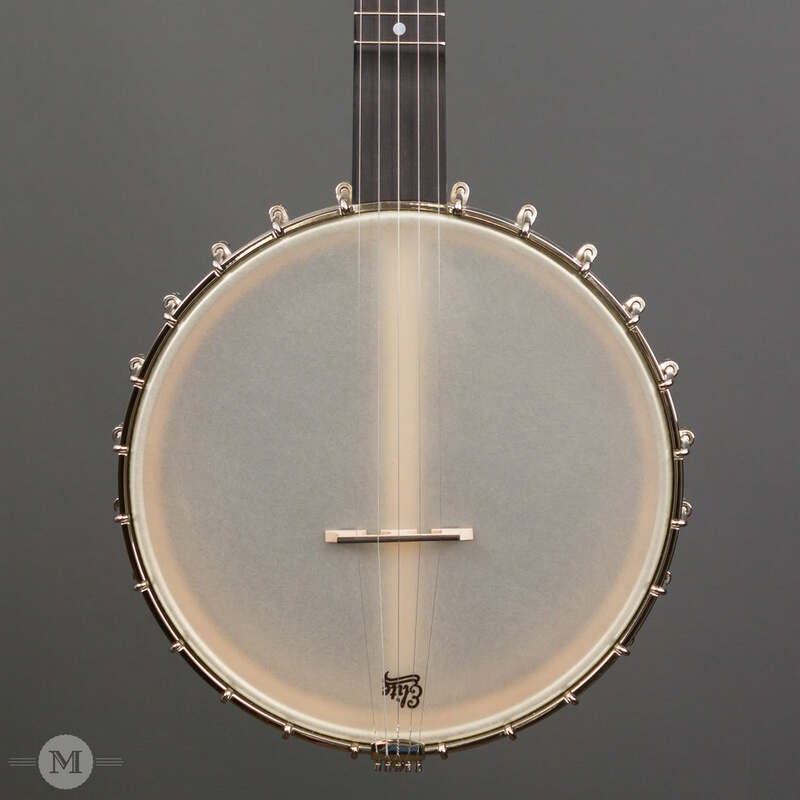 Wonderful warm tone in this open back banjo, built with a Whyte Ladie tone ring, maple rim and neck. You're in for years of dependable delight when you own a Bart Reiter! 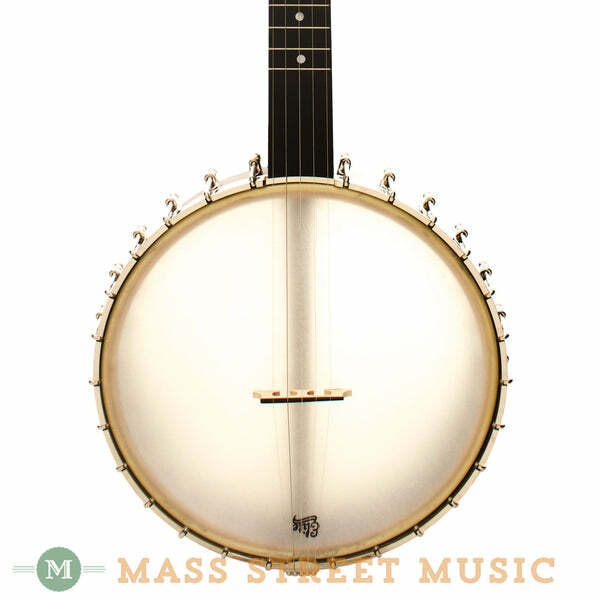 Take a look through our collection of Bart Reiter banjos in the shop! 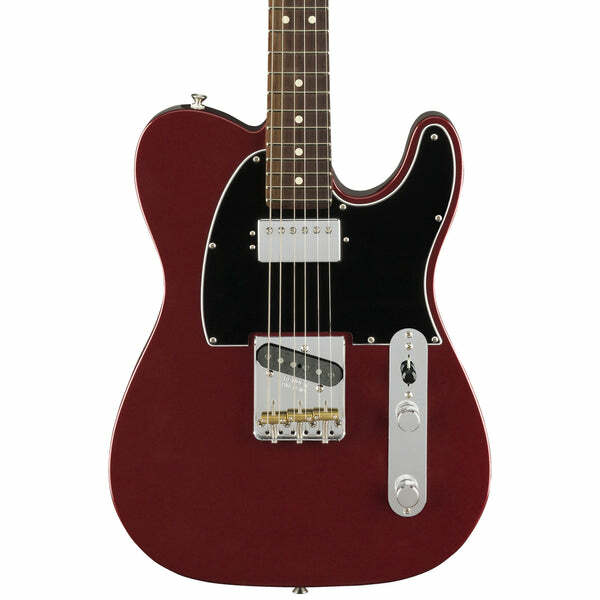 This tele is a great deal on a Made in the USA Fender. The modern C Shape neck is very comfy, and has just enough meat to the profile that I feel right at home coming from a more vintage-spec guitar. Tons of great Fender Guitars in the shop right now! This guitar rocks! The Custom Lollar pickups sound amazing...heavy and thick when full on in the neck position, articulate and grungy with the bridge pickup cranked, and cleaning up perfectly with the volume rolled off a little. Check out our collection of Electric Guitars! The C100 body shape that Collings worked out back in the 90s has returned as a new model in 2018. This Deluxe build from '96 features some nice appointments and Koa back and sides. 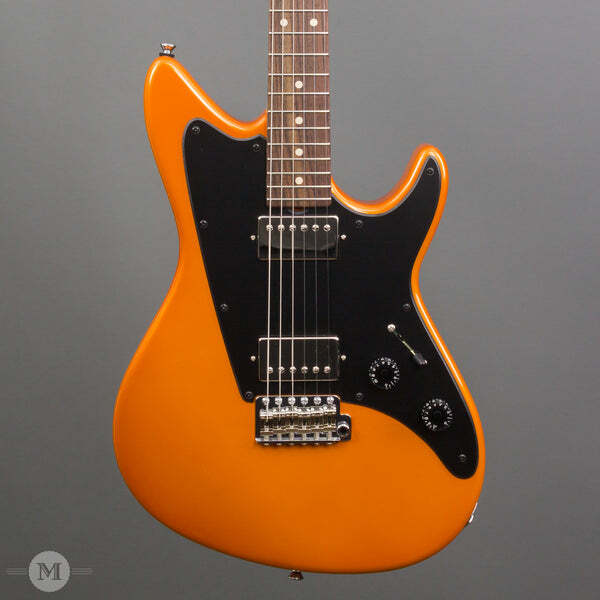 Really nice, powerful, small body guitar and one of only 20 or so originally made. One of my new favorite drive pedals. 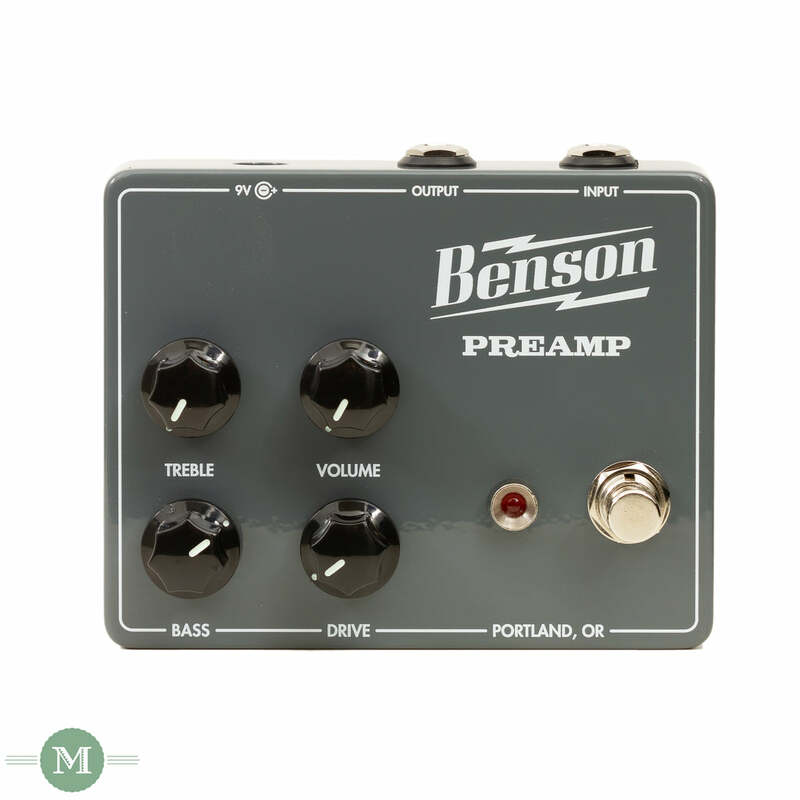 It can be used as a clean preamp to give an amp more character, or be used as a gain pedal. It sounds great as a low gain or high gain pedal. 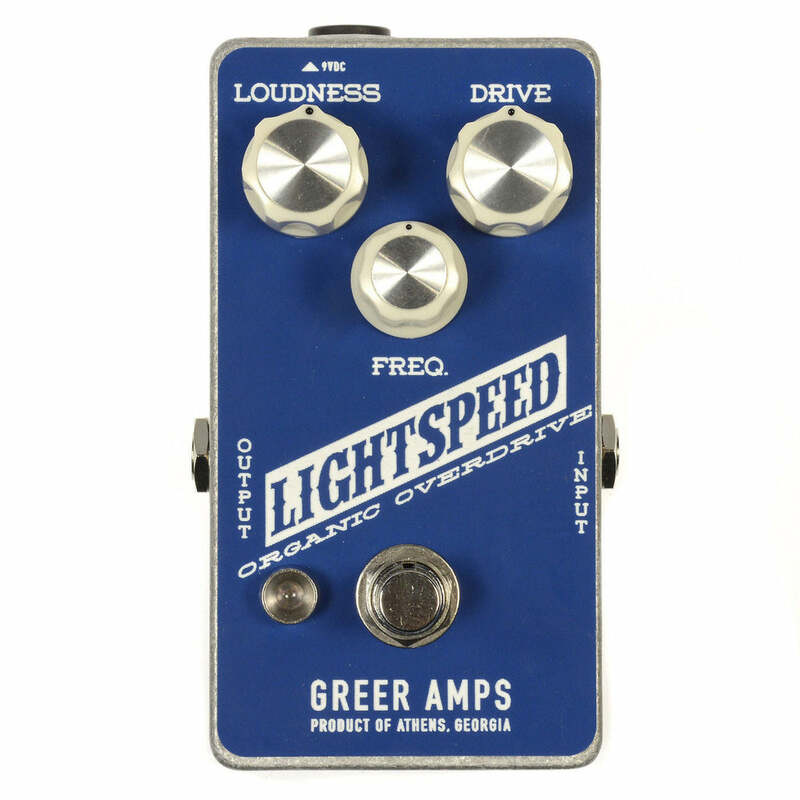 I have mostly been using mine as a light gain pedal that also adds the right amount of compression. 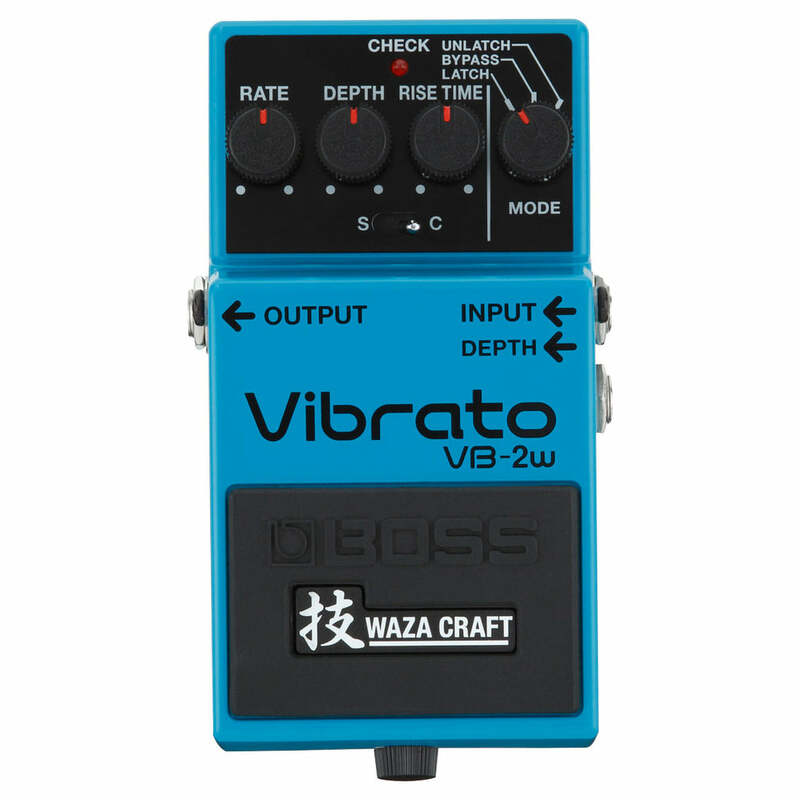 Really great pedal! This Tom Anderson is one of my favorite guitars that I have ever played. The distressing feels great for such a highly modern-playing guitar. Vintage shell pink and matching headstock! What more could you want? Check out our current collection of Boutique Electrics. Last weekend I had some guys over for a fun classic rock jam in my basement. The Supa Cobra was at the core of my board for the day and it sounded absolutely amazing! I enjoy running it fairly low on the gain knob for rich, fat rhythm tones and hitting the front with a Keeley Katana Mini for more grunt and volume. I can't tell you how happy I am with this unit. Get yourself one! Check out our collection of in-stock Pedals! I've been really into Jazzmasters lately and the features on the new American Professionals really take some of the quirkiness out of the originals. I love having the 3 way up at the top instead of the dedicated neck controls and the addition of the Mustang bridge really helps keep the saddles from moving. The posts have also been upgraded to a more stable platform. 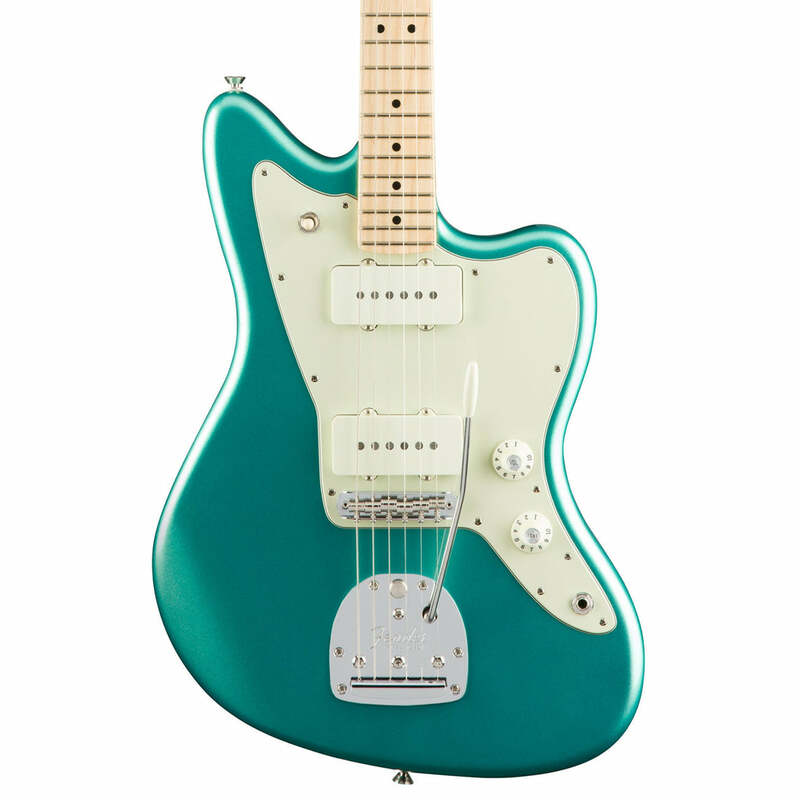 Check out our collection of American Professionals from Fender! 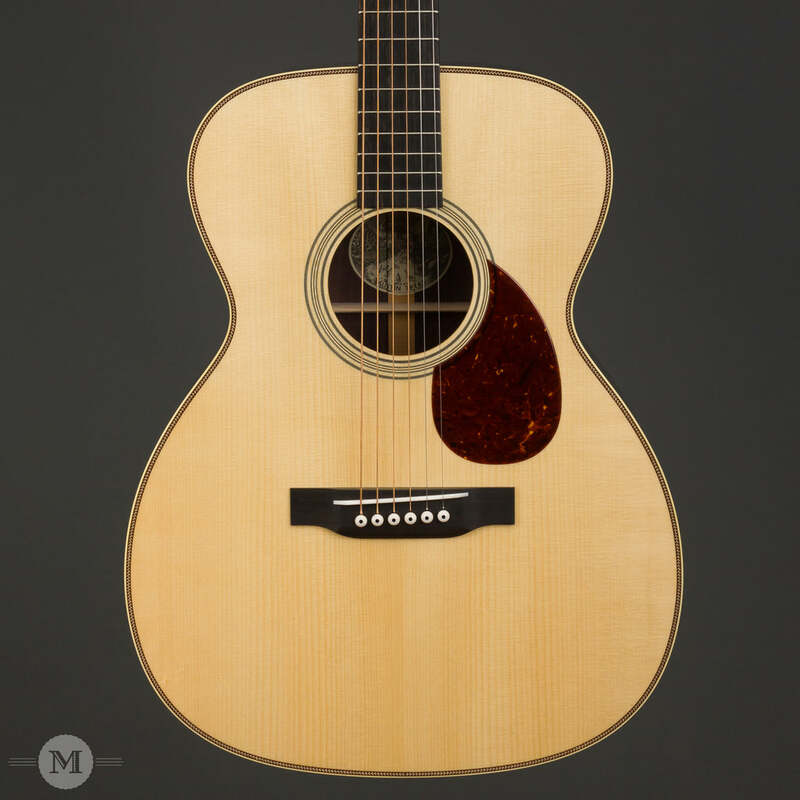 All of the guitars in the Collings Traditional line have been some of the best new acoustic guitars we’ve ever seen. With a more vintage inspired voice and build, these are strong candidates for being the prized vintage guitars of the future. I personally play a D1A Traditional which is an amazing guitar. It is an absolute workhorse and handles anything I throw at it. Through effortless playability and a broad dynamic spectrum, it is constantly inspiring me and pushing me to the next level. I want my playing to be worthy of such a fine instrument. 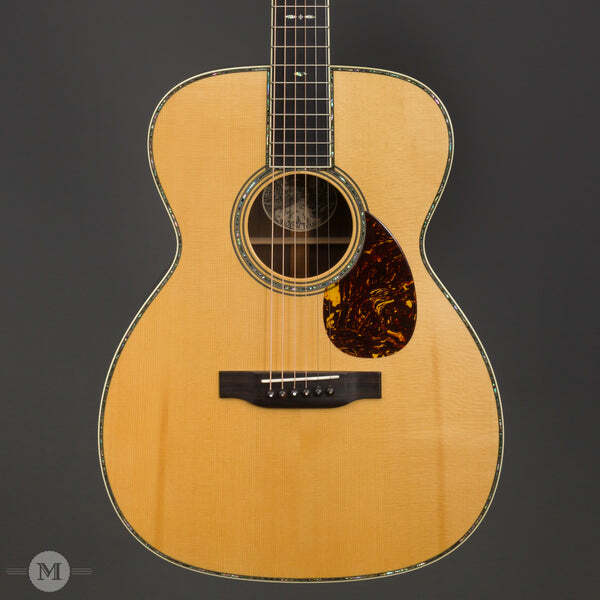 If you haven’t played a Collings Traditional yet, come by and see what you’re missing out on. 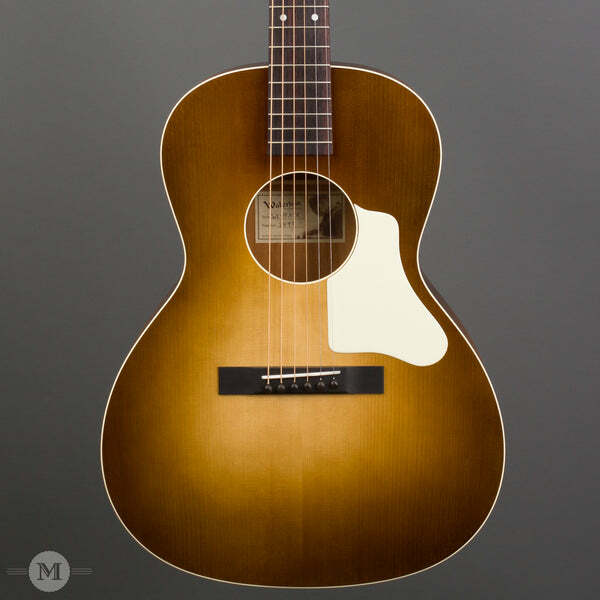 You can own a piece of history with this 1917 Gibson F4. It's in wonderful condition, especially for being 102 years old! Easy to play all the way up the neck, this Gibson F4 has a very full, piano like sound, with sustain that goes on and on. I love the delicate design on the Handel tuner buttons. It's an exceptional mandolin! Take a look through our collection of used gear at the shop! These Maple GS Mini basses have blown me away. Something about the laminated Maple back and sides make these models punchy and direct, in a way that works great for campfire jams or for a more portable acoustic bass rig. Plug it in and you've got a really great electric bass sound, that would honestly fool me when mixed in with the rest of a band. 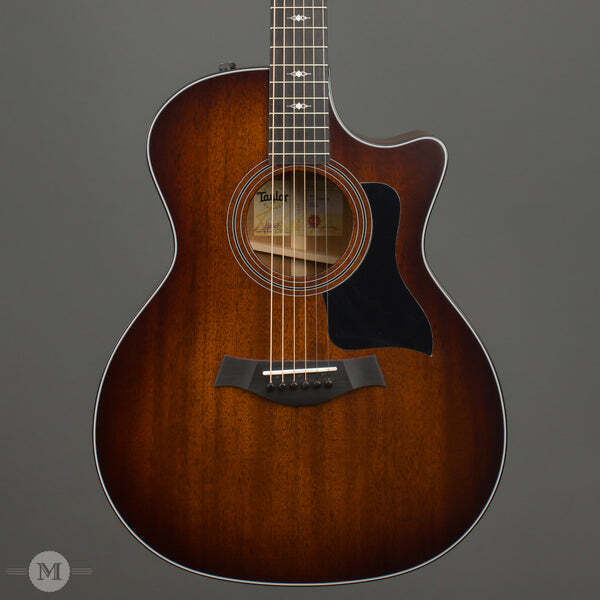 Great option from the folks at Taylor. 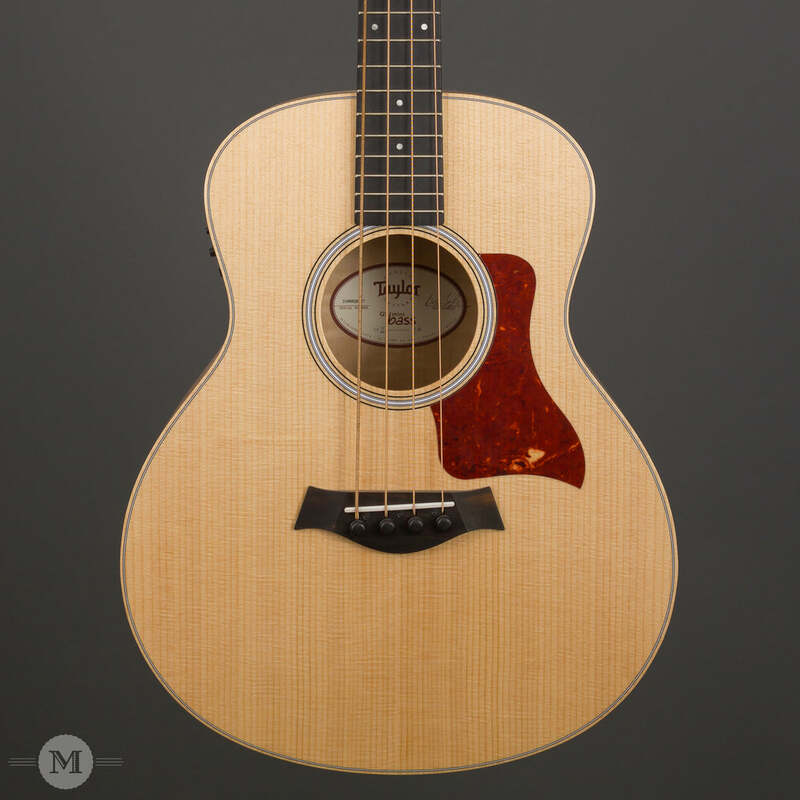 Tons of great Taylor Guitars in the shop right now! This Icon Classic rings out so clearly, even when unplugged. Great for lead lines up the neck, very expressive/vocal and screams to be played with the trem arm. Check out our collection of Anderson Guitars! Extremely comfortable neck profile matched with a very responsive guitar. 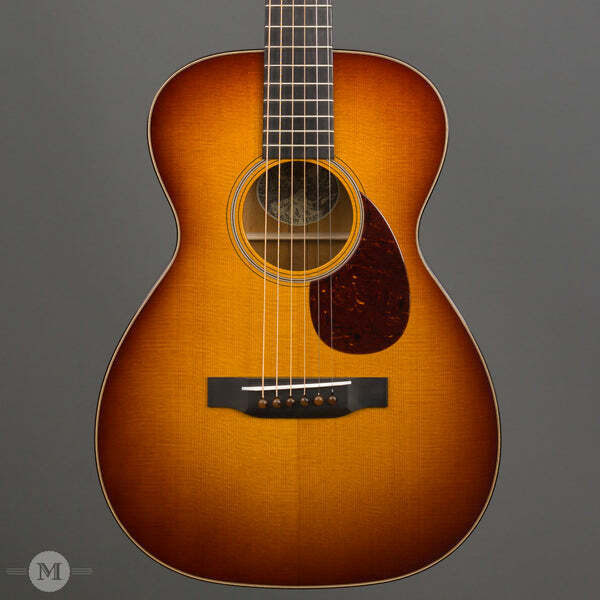 These new necks are some of the best feeling we've had from Collings. 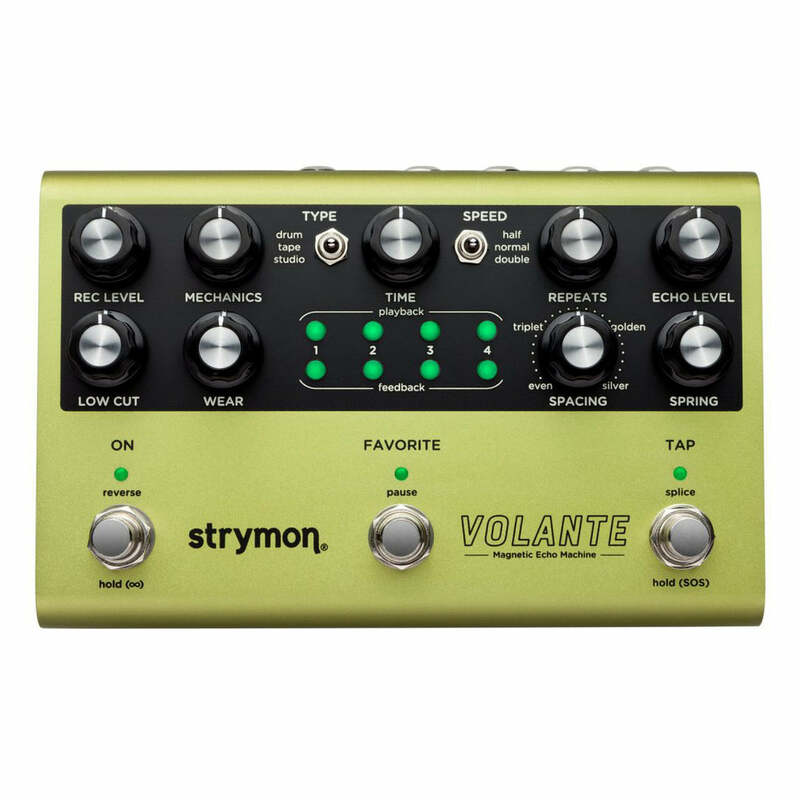 Another amazing delay from Strymon! You can get anything from Binson echorec sounds to studio tape delays. 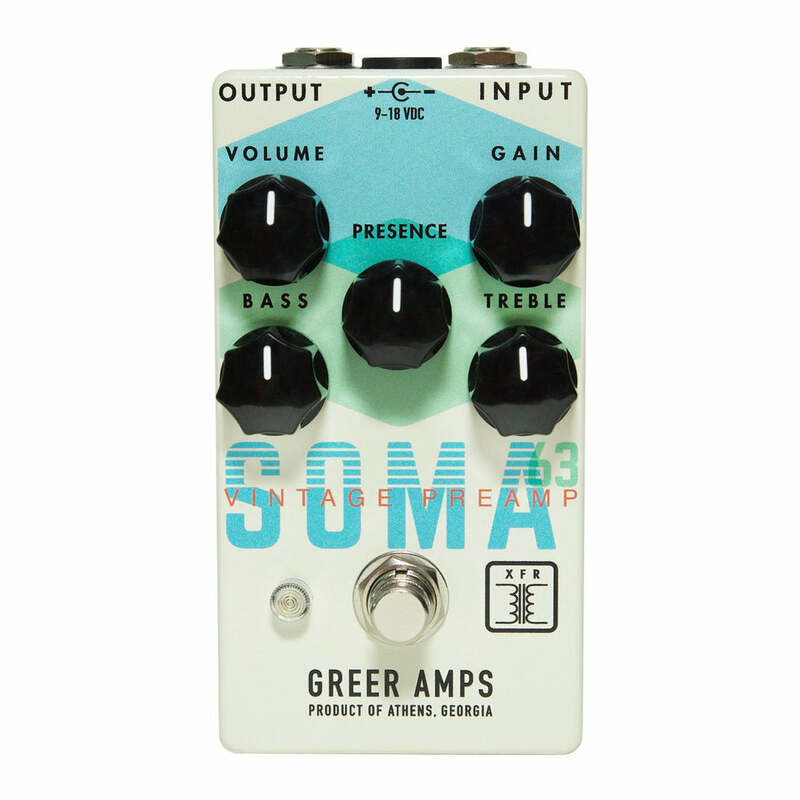 The multiple heads give you endless options for rhythmic delay sounds or ambient washes. The sound on sound mode is very useful, and the built in spring reverb sounds great! Check out our collection of Strymon Pedals! The new builder's edition is fantastic, Taylor keeps pushing the envelope with the V-Class architecture. Really looking forward to the new Grand Pacific and Grand Concert, but the Grand Auditorium hits a serious sweet spot. Check out our current collection of Taylor Guitars. I can't say enough good things about this amp - it just exhibits pure vintage Fender vibe and tone! Fantastic touch-sensitivity and breaks up very nicely with the Cream Alnico speaker. By far, one of my favorite amps in the store! Check out our collection of in-stock Amps! This guitar is a little gem! Beautiful to behold and with a full tone despite its size. An obvious choice for fingerpicking, and I loved the way it responded to a flatpick! 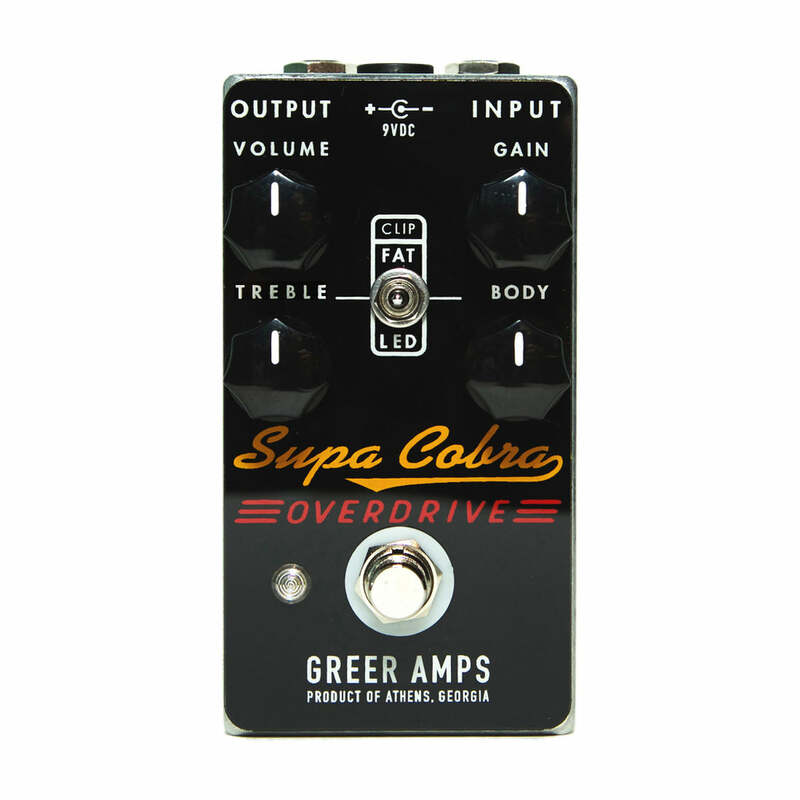 Greer is making some great overdrives, if you're looking for either a small boost or medium overdrive this is the one. These straps are great! I've got one for my banjo and my guitar and they perfectly distribute the weight of the instrument in a comfortable, yet fashionable way. I'm thinking about getting a couple more! 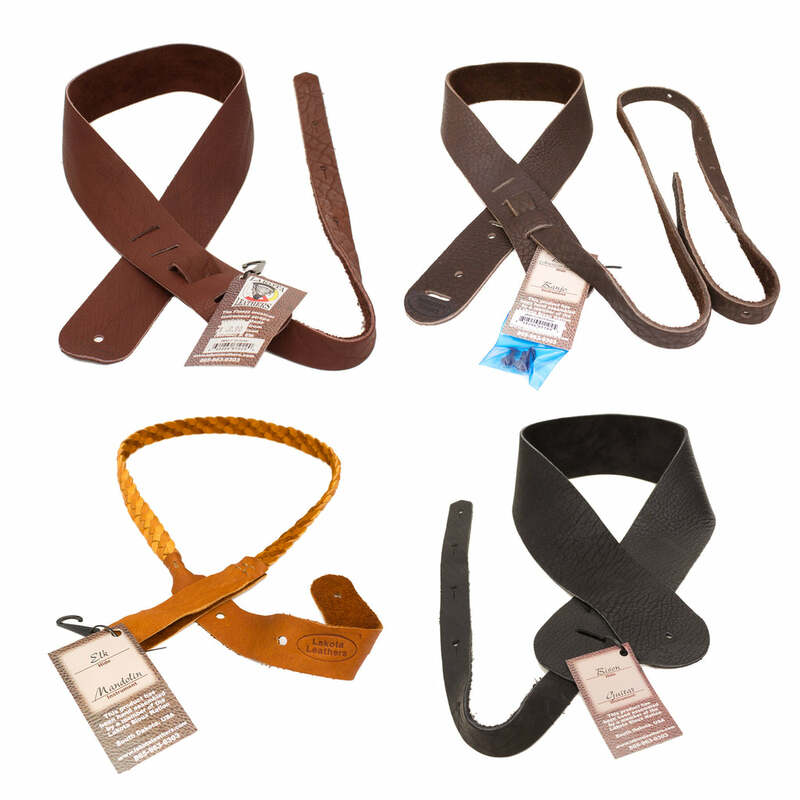 These are made with excellent quality leathers, with many styles and color options. A great accessory to go with a fine instrument! We have a ton of accessories that don't make it to the website - stop by and check them out! 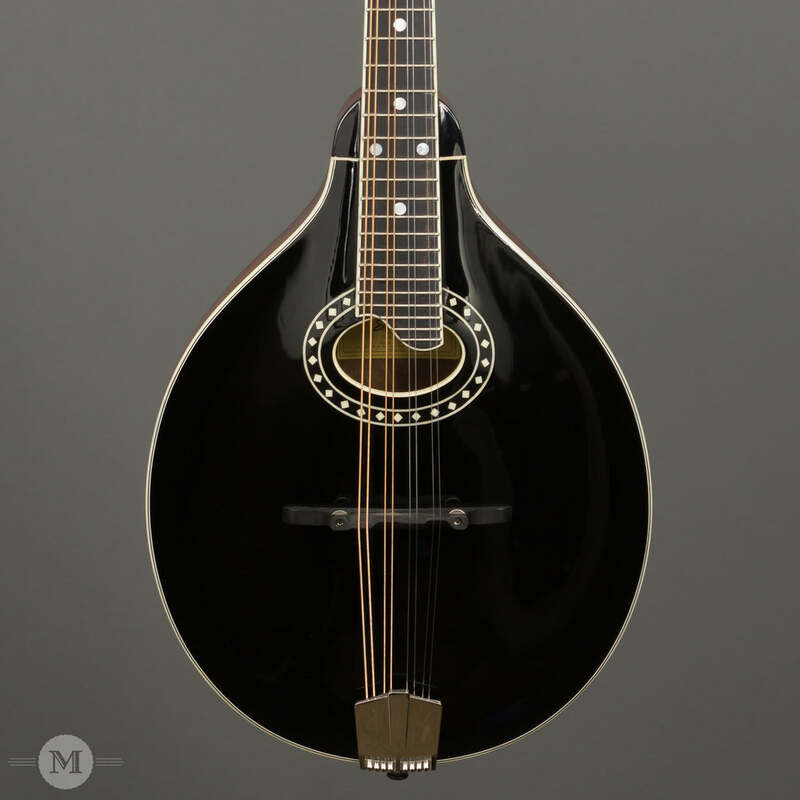 The Eastman MD404 oval hole mandolin has a lovely sound and plays easily up and down the neck. 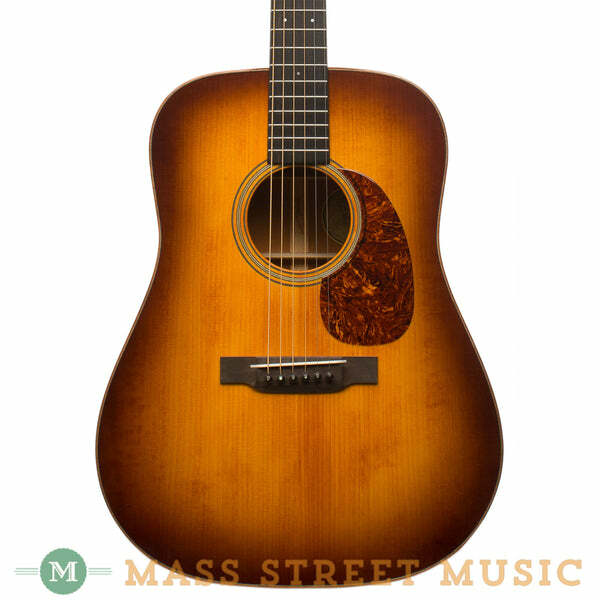 Made with a solid spruce top and solid mahogany back and sides, this is a quality instrument at a great price. Even comes with a hard shell case! 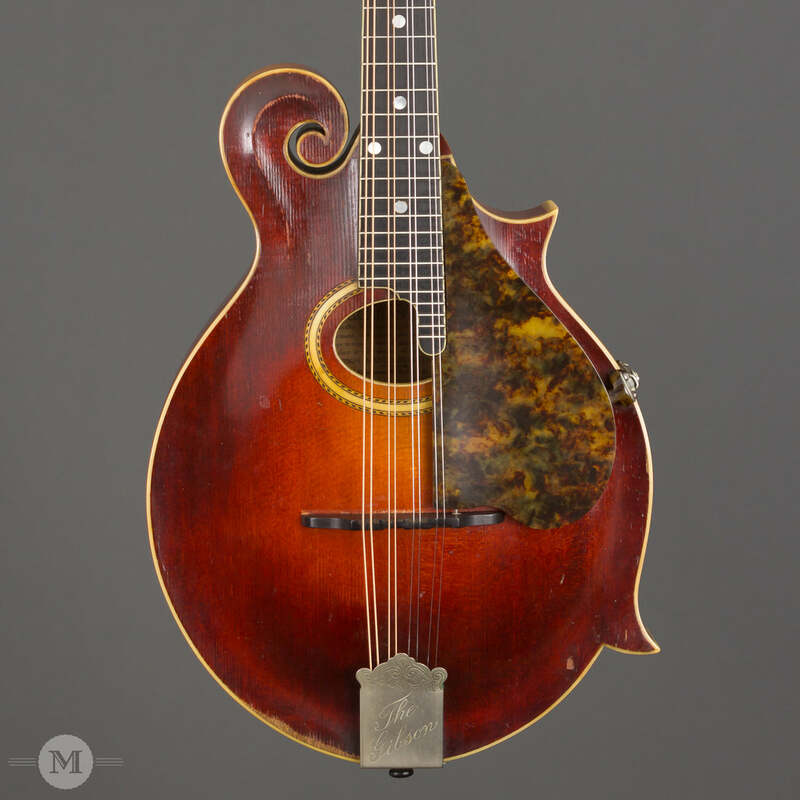 Check out our collection of Mandolins! This Georgia Green Electromatic catches my eye every morning when I walk in the door. 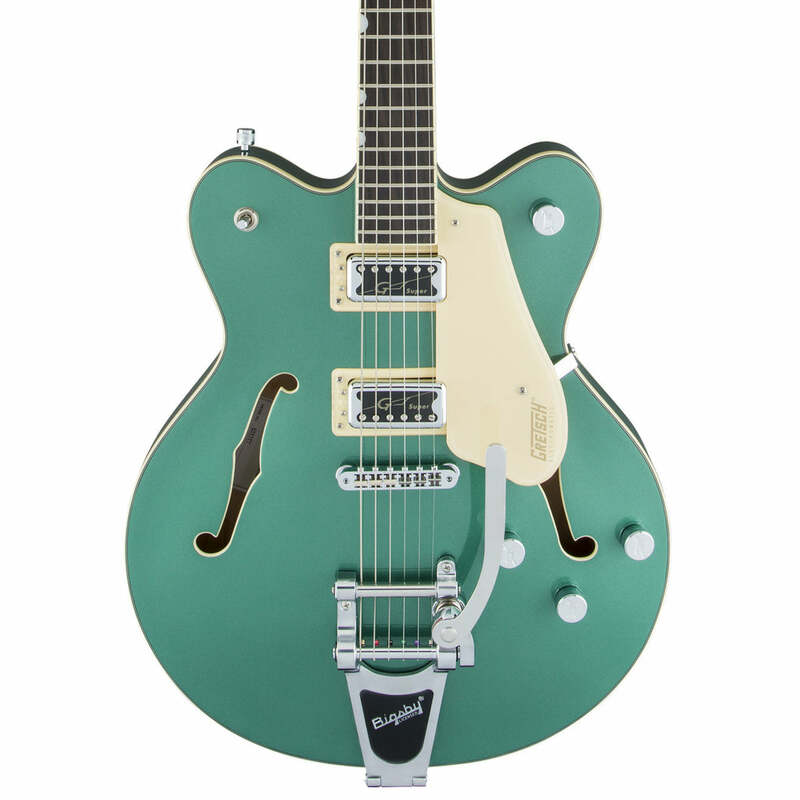 Something about the Green/Cream combo and the vintage inspired pickups that makes me want to start the day playing it. Great deal on a thin archtop! Tons of great Gretsch Guitars in the shop right now! The whole package here is just so enticing, especially when combined with the almost impossibly small Collings case. This parlor-sized traditional is a small, comfortable player, yet expressive and dynamic. 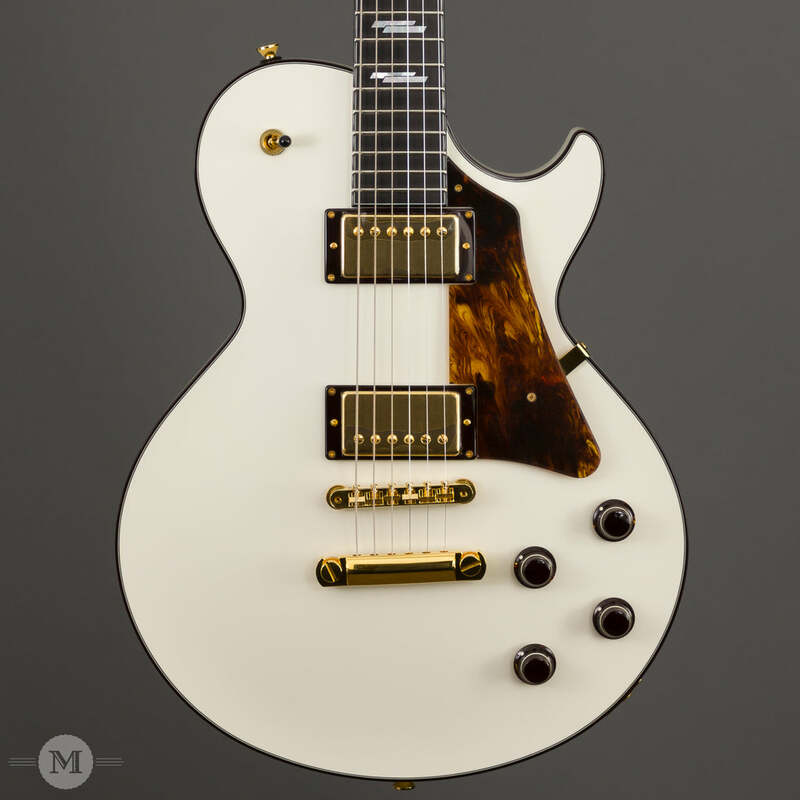 Check out our collection of Collings Guitars! Beautiful set of Brazilian Rosewood back and sides on this OM42. This guitar absolutely lives up to its tone woods and appointments. Great playing guitar. Don's G90 pickups are super versatile. Resonant, light weight, and the charcoal frost finish looks great! Liked it so much I ordered one for myself! Punchy and raw tones are in full effect with this Flea Jazz Bass. The active electronics allow you to dial in just the right amount of gain for your rig. Check out our current collection of Basses. We have such an incredible selection of great pedals here at the store, so much that I had almost forgotten about this gem! It absolutely nails the old Supro tone we all know and love. If you're not familiar, just listen to Led Zeppelin's debut album. It also covers roots-rock/Americana territory in spades. This pedal may need to come home with me! The Elliot 1-3/4" Elite Push Button Capo is an excellent hand-crafted lightweight capo, made from high quality stainless steel. Built to last a lifetime or two! Love the shape and I really like the all mahogany box. Check out our collection of Waterloo Guitars! I've gone Whyte Laydie tone ring crazy!! This Regent is another fantastic banjo from one of my favorite modern makers, Bart Reiter, up in Lansing, MI (One of my personal banjos is a Bart). This instrument features an 11" pot, Maple neck and Rim construction, and a Whyte Laydie tone ring. One of the most versatile banjos I have ever played. A monster for fingerstyle, clawhammer, or whatever else you can throw at it. Huge full rich sound - somehow warm, mellow, but bright and crisp at the same time?! I highly recommend checking this one out! The banjos all sit right outside my office, a constant temptation! Today I picked up the Bart Reiter Round Peak to play a couple tunes. I love the tubby, low sound of the 12" pot which is perfect for frailing, with a warm mellow sound, but when you put on your picks it also sounds great playing Scruggs style tunes! Bart makes an extremely affordable, yet great playing banjo. You can't go wrong with a Bart Reiter! Take a look through our collection of new gear at the shop! 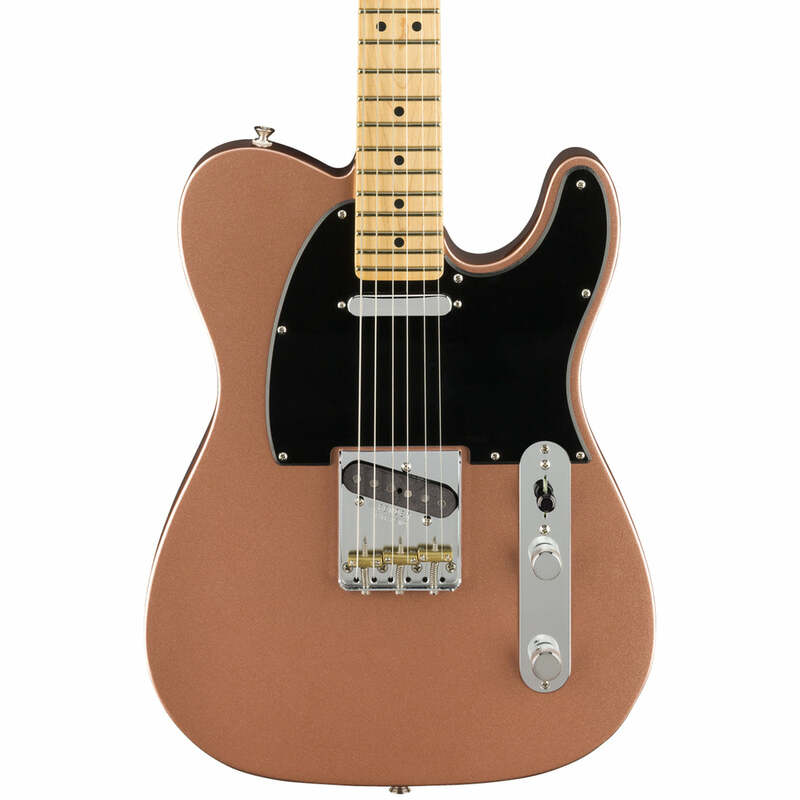 A Rosewood board tele with a humbucker in the neck is the way to my heart. 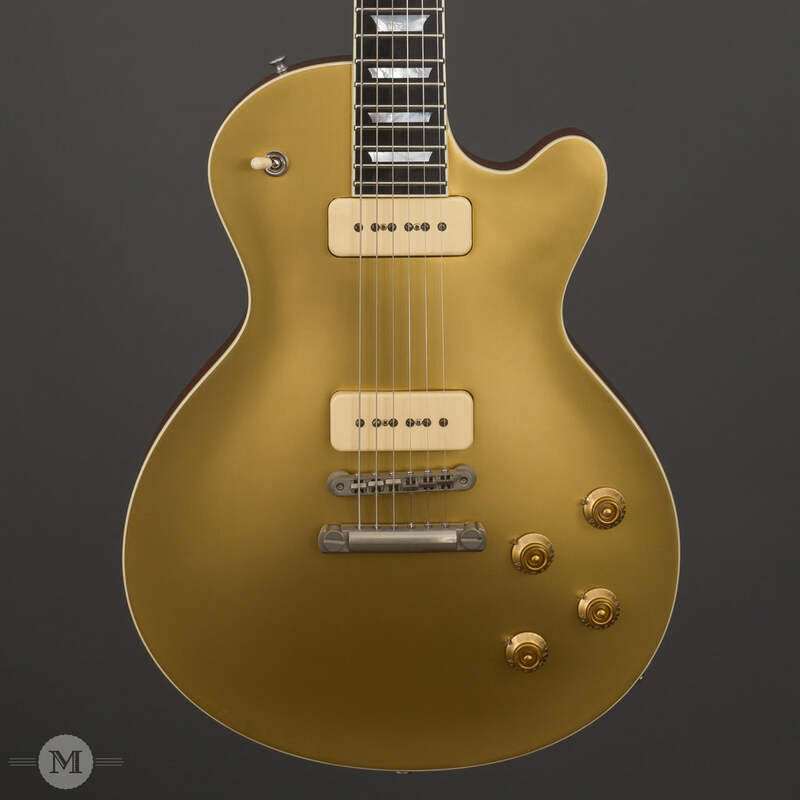 Love these new American Performer series builds, especially the vintage details like brass saddles along with a few modern upgrades like a push/pull coil tap on the neck pickup. The pickups in this tele are probably the best pairing of a humbucker and single-coil bridge pickup that we've ordered. I think they work really well together, the color is gorgeous, and I wish I had with me at all times. Check out our collection of Tom Anderson Guitars! Cool guitar in an even cooler finish. 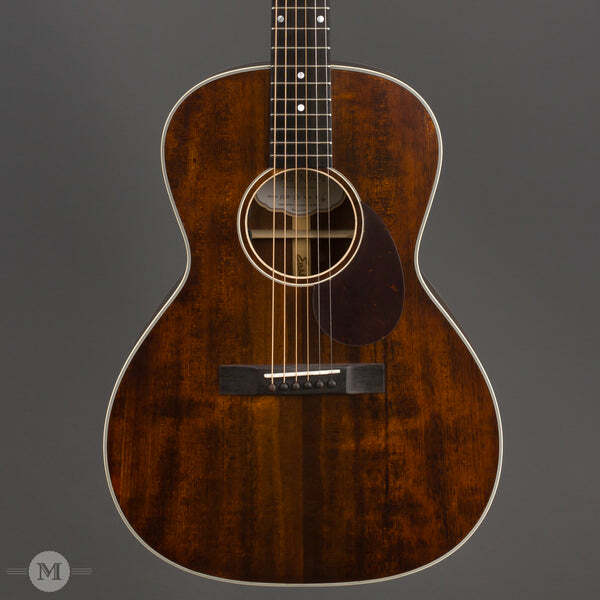 Hard to top this short-scale, sloped-shoulder build from Collings. Ridiculously good guitar! I really love the sound of the PH-2 in the bridge of this guitar. It is fatter than a standard single coil, but still balances well with the neck and middle pickups. Great feeling neck and incredibly resonant guitar! As a big fan of the V-class, it is great to see if come to the 300 series; more affordable and stripped down, this is a top-line working-person's guitar. I dig this pedal so much! There is good reason the Xact Tone Solutions Winford Drive can be spotted on pedalboards of many top players. You can cover so many bases with this unit - from Classic Rock rhythm grit to high gain for big leads with tons of mid control to help you cut through any mix. True bypass and built to take abuse from the road. Hand made by a great crew in Nashville, TN. This is a lovely guitar, endowed with the quick string response and open tonal character we've come to expect from the Traditionals. Its incredible volume gives the illusion of playing a much bigger guitar. 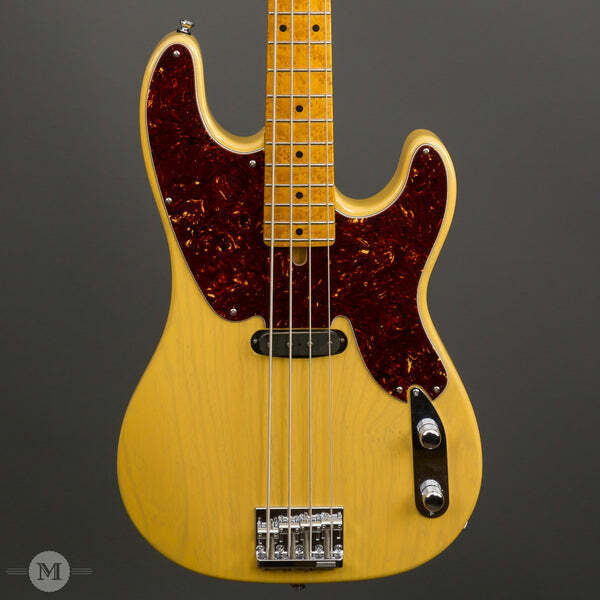 A modern classic, this T bass is such a killer instrument. Don't let your chance slip away and pick this up. Check out our collection of Used Gear! This is the plunkiest old-time sounding Ome I have played yet. Lots of natural woody character but still retains the pop and brightness Ome banjos are known for. Steel strings are nice and powerful but this would also be a great candidate for a set of Nylguts. I love the sound of resonator guitars and the Gretsch G9200 Boxcar guitar is a great sounding, affordable resonator you can add to your line up! The mahogany neck and body, along with the Gretsch Ampli-Sonic resonator cone, give it a rich, full, warm sound. This is a great way to add some variety to your sound! Take a look through our collection of Gretsch Gear! 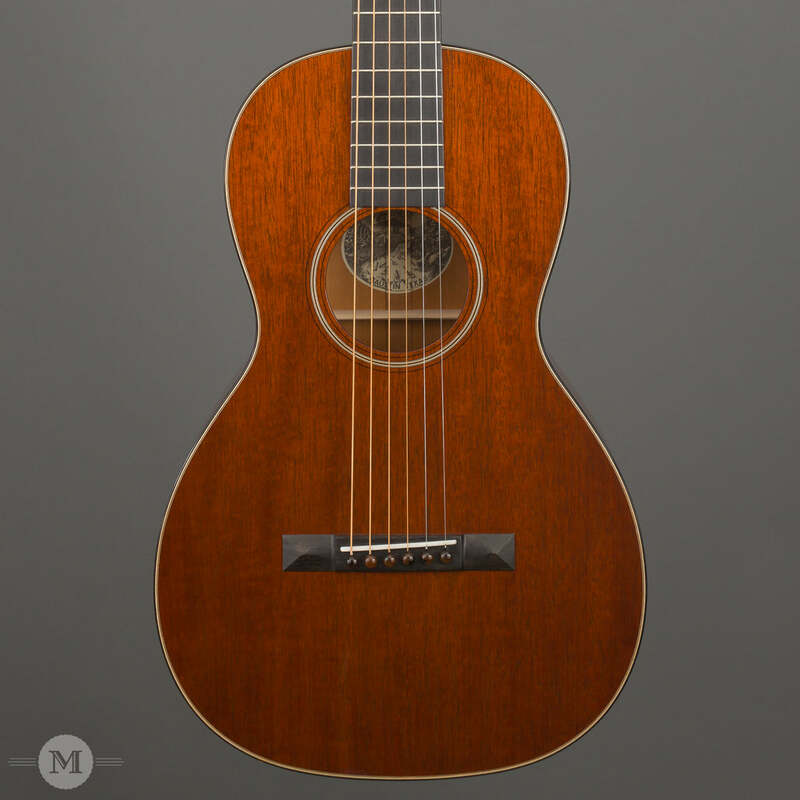 This all-Mahogany build from Austin, TX is one impressive guitar. So often all mahogany guitars are muddy, and boxy, but this X-braced model is clear and articulate with a ton of warmth from the Mahogany top. The vintage neck shape totally harkens back to those pre-war budget builds of old. Tons of great Waterloo Guitars in the shop right now! I'm very excited to have our Builder's Edition arrive. This guitar has been a long time coming and represents the next evolution in guitar building from Taylor. 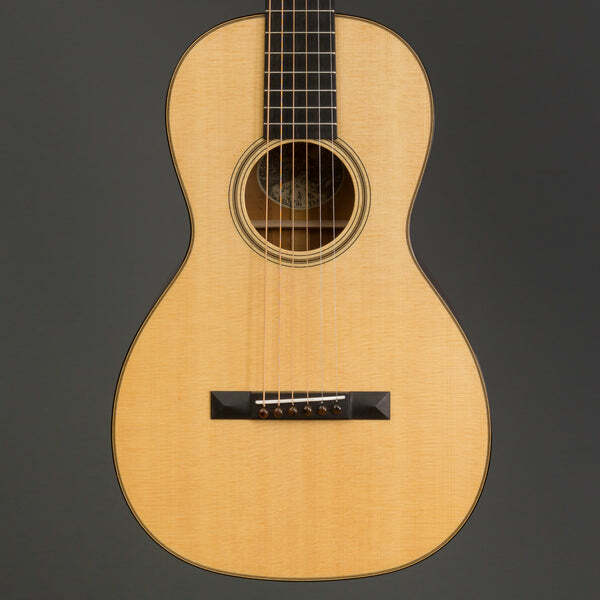 The sculpted neck joint, and the beveled body edge treatment are very nice upgrades and the Koa back and sides work very well with the new V-Class top. 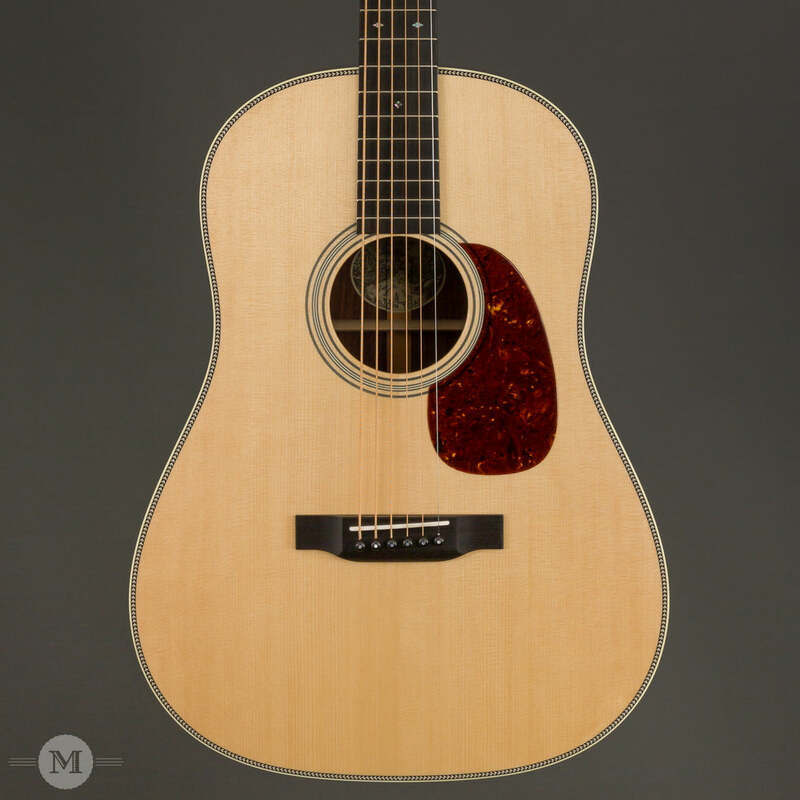 Check out our collection of Taylor V-Class Guitars! Responsive and big sounding smaller guitar, and very comfortable to play. This is the real deal! My favorite pedal for rounding out single coil guitars or pushing an already distorting amp. Super cool and fun to play. It's the real vintage deal! 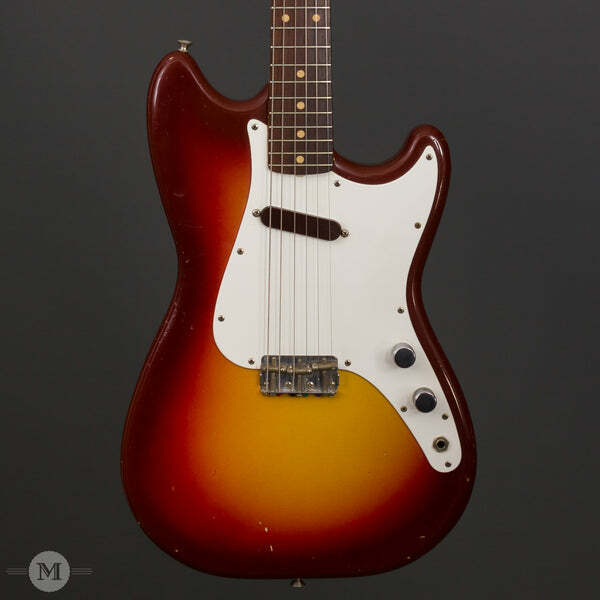 Check out our current collection of Vintage Guitars. Fuzz pedals and treble boosters are such an integral part of crafting classic, vintage inspired tones. From Cream to Eric Johnson to Black Sabbath all the way to Jack White...it's ALL in this pedal! I spent a good amount of time with it, plugging in humbucker and single coil equipped guitars and achieved killer results. So much dang fun! Note: The NOS Germanium transistors used in this pedal are in limited stock, so this pedal is a "get it while ya can" piece! Swipe one up!! Check out all the new gear to hit the web in our "Just In" collection! 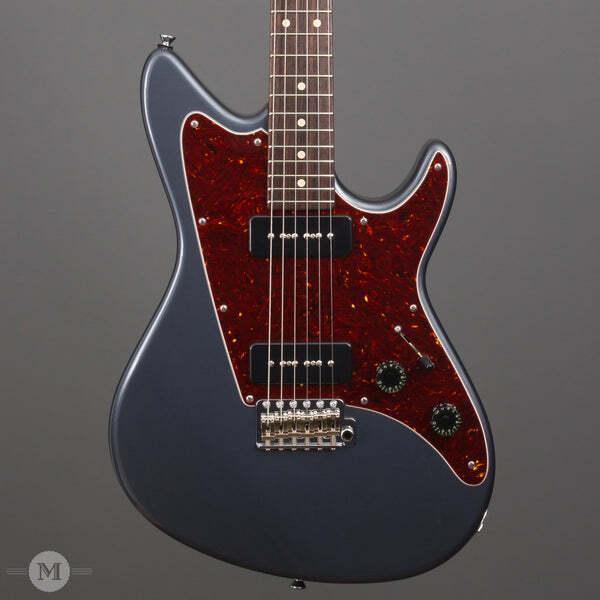 Not very many guitars come in that I dream of owning, just when I thought I had come to an understanding about acquiring new guitars this showed up, and now it’s all I can think about. 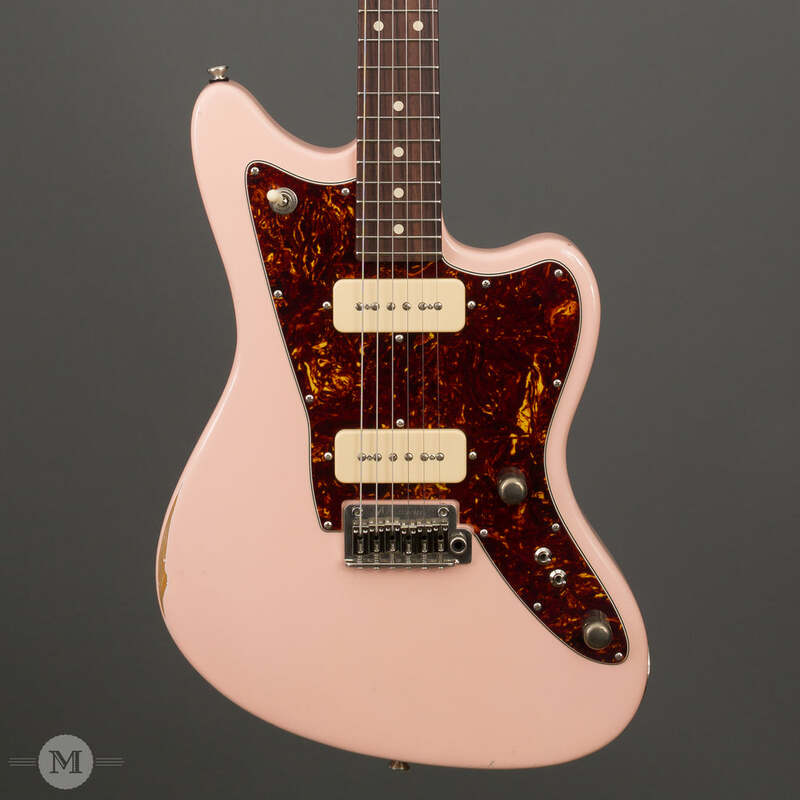 Check out our collection of Boutique Guitars! This is the perfect banjo for anybody. Great sound fingerstyle or clawhammer, and every tuning you put it in rings in its own way. A Whyte Laydie tone ring and Amber head give this a rich full sound, with more stability (less adjusting) than a natural skin head. The star on the headstock seals the deal for me. Check out our Collection of Bart Reiter Banjos! 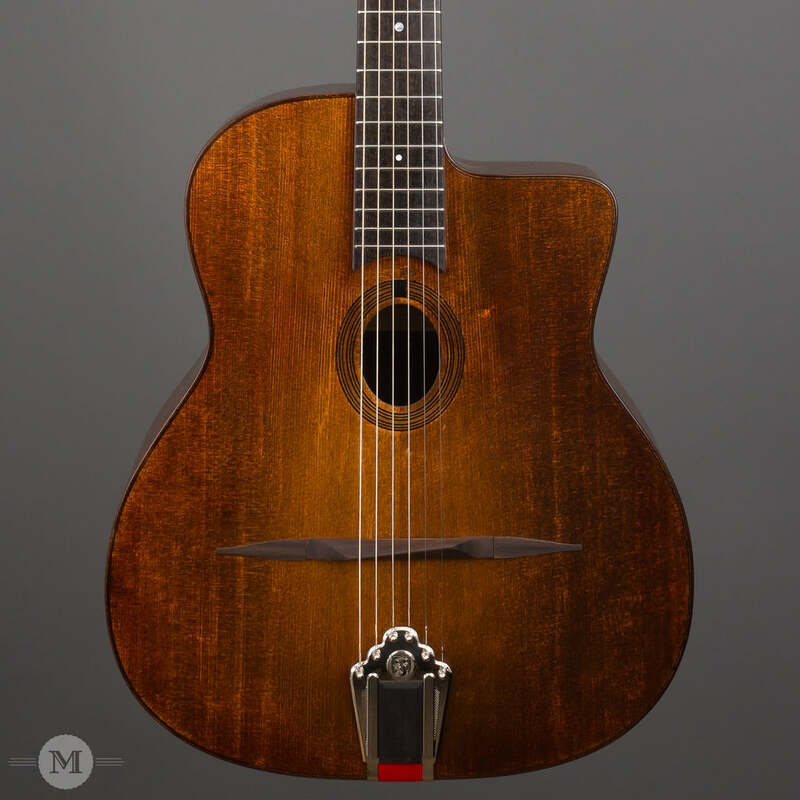 We have a new Collings MFGT in the store, and it's a beauty! 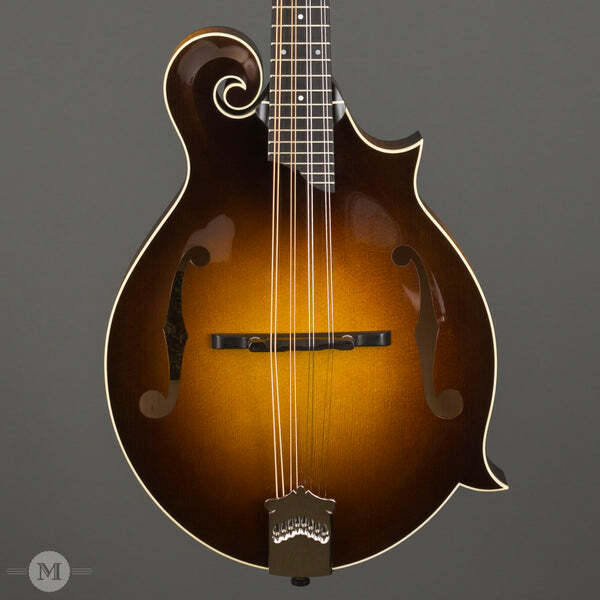 Wonderful tone and excellent craftsmanship make this sunburst mandolin a joy to play. The neck feels great, playing easily up and down the frets with clarity and resonance. You simply can't go wrong with a Collings mandolin! Take a look through our collection of New Gear! 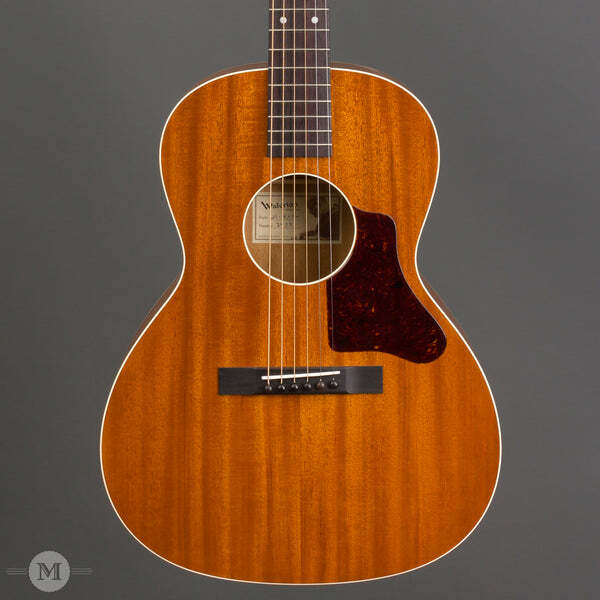 This Boot Burst WL-14 has such a great vintage vibe, with all the playability and comfort of a new guitar. If you're looking for an old-time strummer, or a comfy blues box you can't go wrong with these guitars. I've been playing mine for almost a year it keeps getting better. Out of the stack of Taylor guitars we had down at Winfield I knew this one was a keeper, and that we had to bring it back to the store. 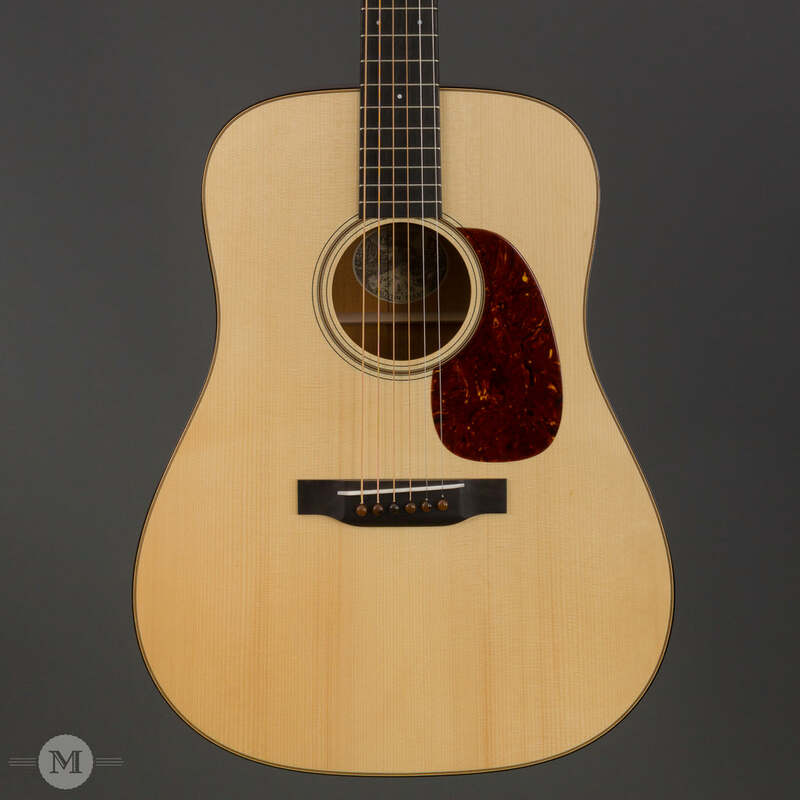 Check out our collection of Taylor Guitars! I was lucky enough to check out the 1 11/16" prototype traditional necks back in the spring. We've been eagerly anticipating these new Traditional builds and it was absolutely worth the wait. If you're a 1 11/16" player and have been feeling left out of the Traditional series, these are the guitars for you. Great sounding amp for both clean and dirty sounds. 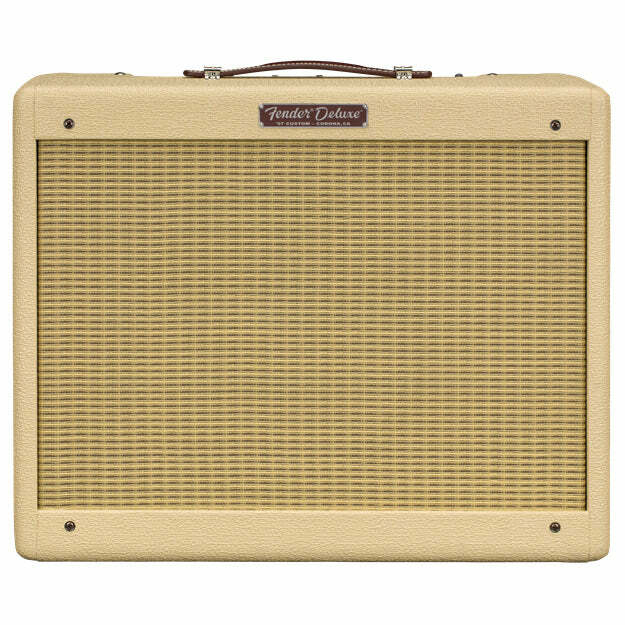 Depending on where you run the EQ you can get mid-60s Fender clean tones or tweedish crunch. Like all DR. Zs it takes pedals great as well! This interface is a must for anyone looking to track drums or start a podcast. With 4 channels of simultaneous recording, get a great room sound plus a few close up mic's, or adapt to whatever recording situation you may need. X-Max preamps sound great with a lower noise floor. 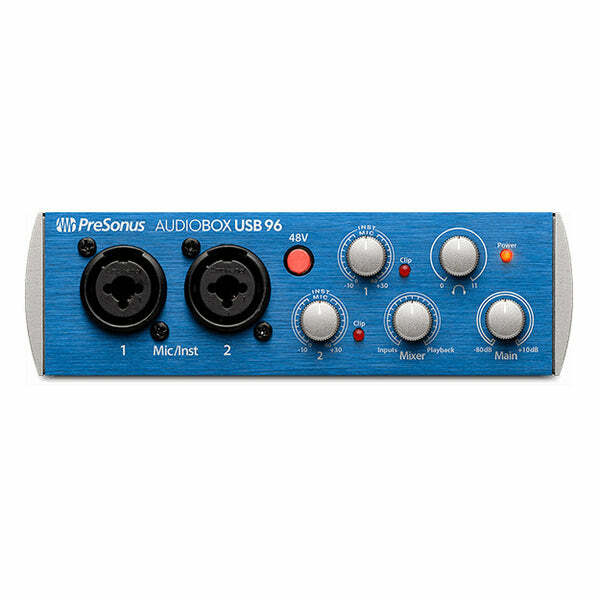 Join our recording clinic Oct. 13th for some great insights on how to use an interface like this. Tons of great Recording Gear in the shop right now! 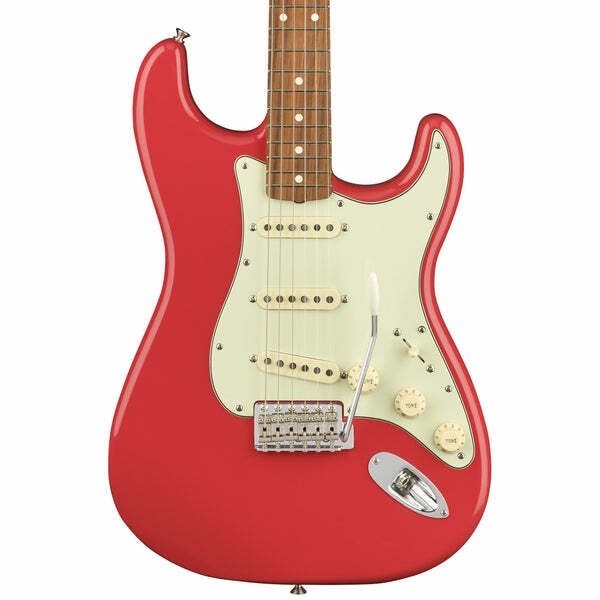 This particular American Original Fender Strat is a stand-out guitar. I have a Candy Apple Red guitar with rosewood fingerboard, myself, so the looks drew me in immediately! Nitro finish, great weight and feels like an amazing vintage guitar right out of the gate. Have one of our skilled luthiers upstairs set it up how you like and you're set! Check Eric's demo on this very guitar! This model got a lot of attention last week at the Walnut Valley Festival in Winfield, KS. We were happy to present an excellent Eastman as a prize instrument in the National Mandolin Championship! There is absolutely no F-mandolin that can touch this one at this price point. Excellent projection with a nice thick bark to the chop chords. Check out our collection of in-stock Mandolins! Anderson guitars are some of the best guitars being made right now. This new Icon Classic blends modern and vintage in a way that can work for anybody. All I can say is 'Wow' when it comes to this one. I fell for this guitar while making some minor adjustments to get it ready for the sales floor. This CW has a rich full sound, beautiful appointments, and the elusive Wheat headstock inlay that really hits home for us here at MSM. 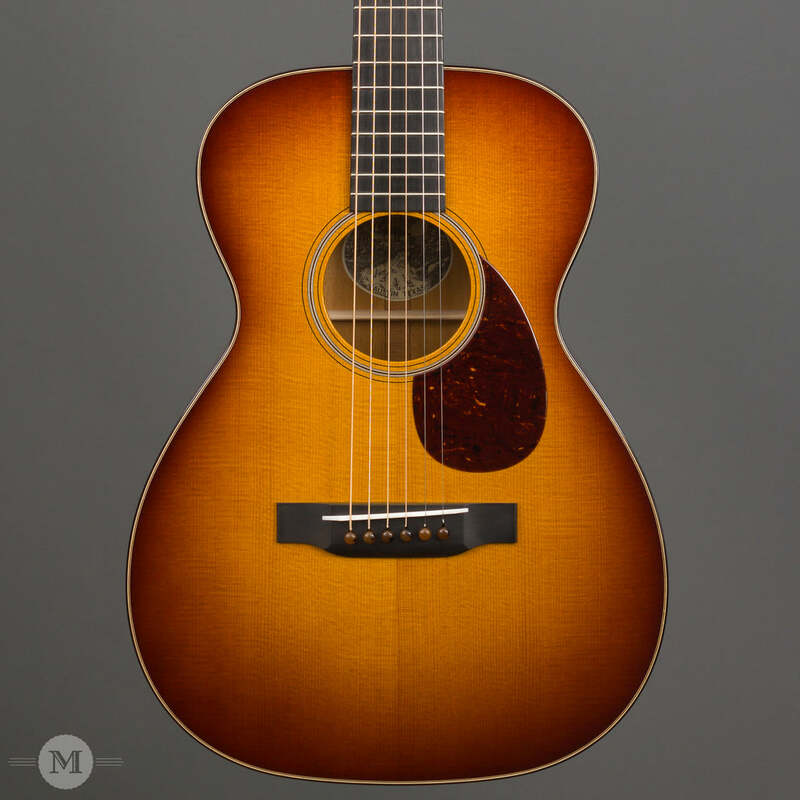 This extra special Collings stands in a class of its own. With aged brass hardware, showy abalone and mother of pearl inlay, and caramel colored tuning buttons the Ome Juniper Megatone Bluegrass banjo is a beauty! It plays like a dream up and down the neck. This Ome has a lot of punch and a full, ringing sound. It's a great banjo! I've been looking forward to this unique piece of gear since the NAMM show in January. Anyone looking for a small, solid state/tube hybrid amp has to check The Amp out. We have them in stock now, so come by the shop and give it a spin! Tons of great Boutique Amps in the shop right now! I have an older version of this guitar in a burst that I've heavily modified, but I love this one just as it is. The lacquer finish gives this Classic Series guitar a high end look and feel. I can't wait to see what this Fiesta Red finish looks like 10 years from now! Check out our collection of Fender Guitars! Jim Baggett – Collings Traditional Guitars - All of them! I've been so excited about the Collings Traditionals I can't pick one over the other. They're all so good. This is a great tool for running stereo. 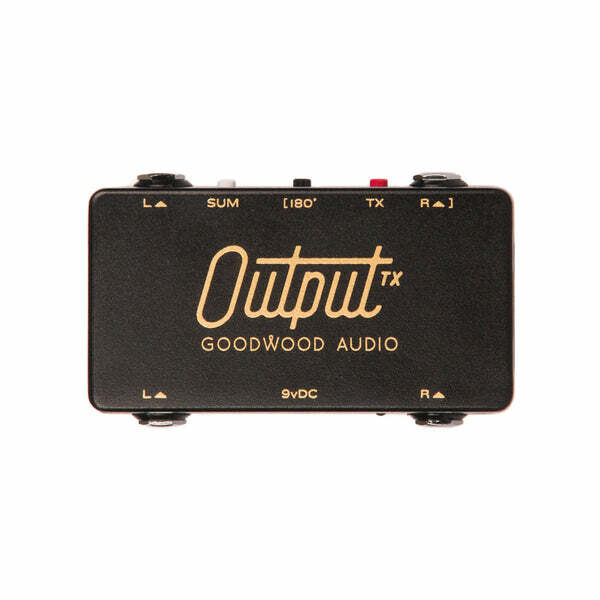 The Output TX fixes all of the common problems of running two amps at once. It has a phase reverse as well as a ground lift. If you are having noise issues with your stereo rig this is a really easy way to fix it. Every part of this guitar feels alive when you strum it. The Traditional package from Collings is a hard thing to describe, because there's not a new guitar out there that is as resonate or lively. The parlor size sounds much larger than it looks and feels...it will be a real head-tuner at your next jam. I recently picked one of these up for myself and could not be happier with my choice. 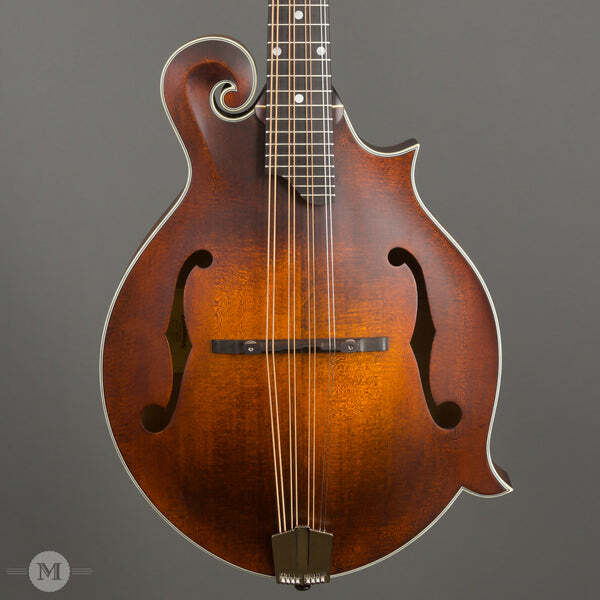 The Eastman mandolin has quickly become the "go-to" for touring musicians - and with good reason! I had a K&K pickup installed and plan to give my new baby plenty of use in the studio and on the road. Small tube amps really have a sweet spot at home and at gigs. 10 mins with this amp proved why the Fender Deluxe circuit is still strong today, and why it's so widely copied. Check out our collection of Boutique Amps! What a killer guitar. 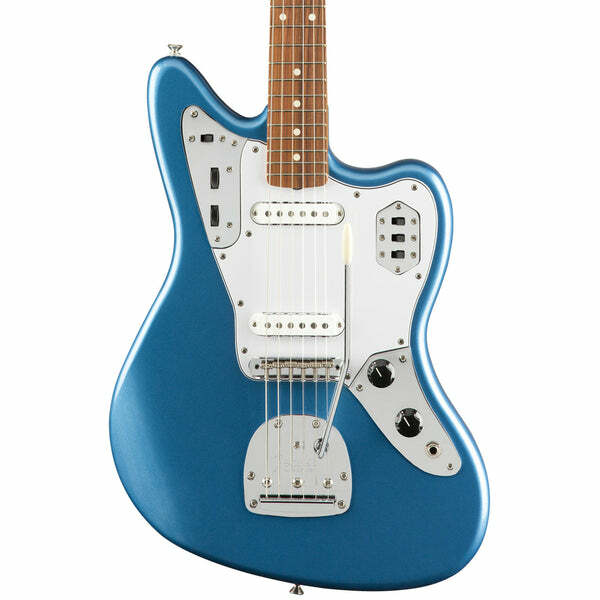 I can't decide what I like about it most - looks, sound, or playability. The sound is a familiar one we know and love well here at the store, reminiscent of an old D-18, but with it's own unique voice. Every note is inspiring on this guitar, with a full rich sound all across the spectrum. The sunburst is beautifully done, and together with the wood binding and tuner buttons make for a great looking guitar. I highly recommend coming in and picking some tunes on this one. 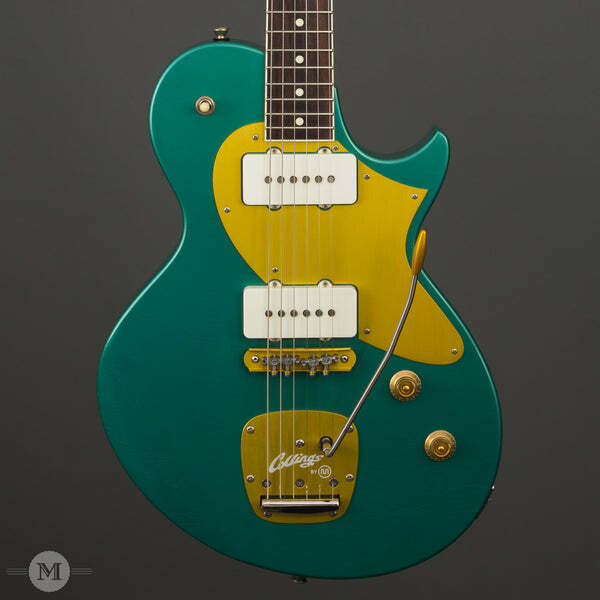 Check out our Collection of Leo Posch Guitars! 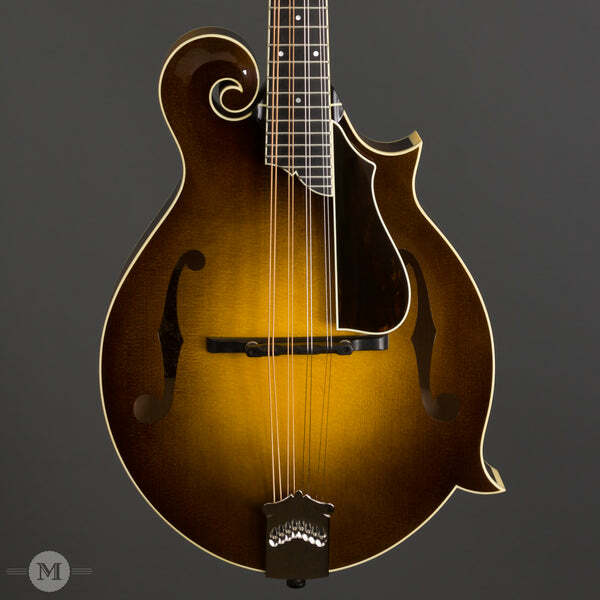 What a treat to get to play the new Collings MF5 Cremona burst mandolin we have here in the store! This is, of course, a beautiful mandolin, with Eastern Flamed Maple back and sides and an Adirondack spruce top. The back of this flamed maple neck glows! Super clear and clean note projection up and down the neck with plenty of volume, and as always, it's fun to chop out some chords and listen to all the wonderful tones ring! These were recommended to me by our resident pro-audio expert, Matt Pelsma. There's something so satisfying and reassuring knowing that when I'm editing audio or video that I'm hearing what the end user will be hearing as well! 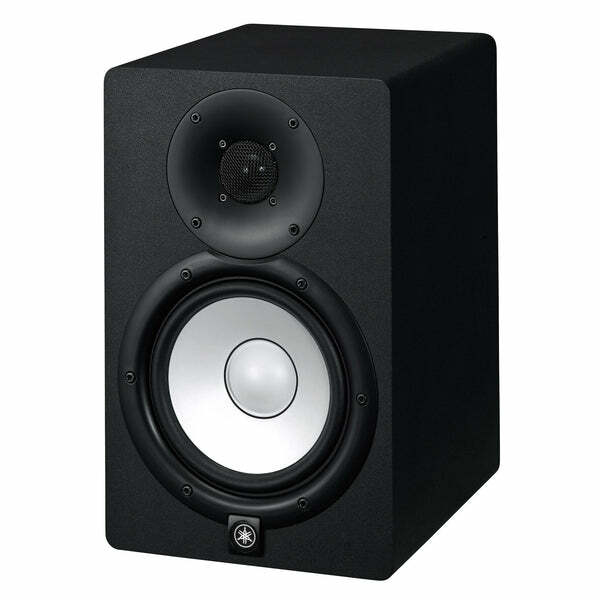 Plus these monitors are great for listening to music at my workstation and picking up new details from my favorite recordings. Get the low down from Pelsma this Saturday at our free Monitor Mixing Basics workshop! 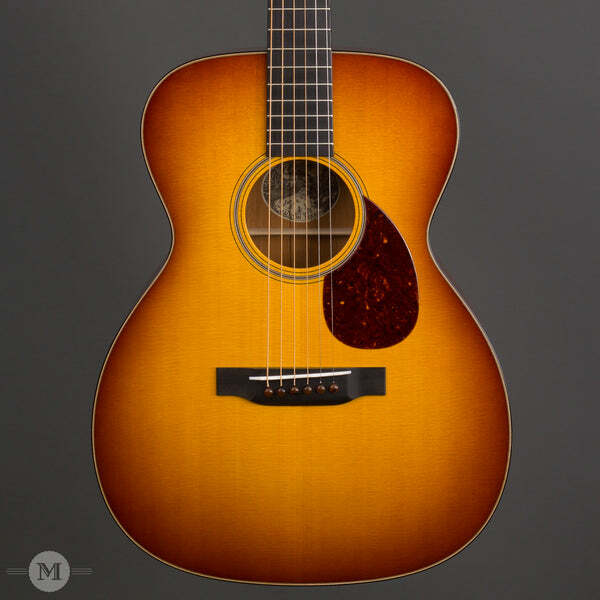 Warm, mellow tones from a small body guitar that is extremely resonate and responsive. This guitar has been turning heads around the shop all week. Really interesting and unique sounding 00, love the look and tone of the Wenge. 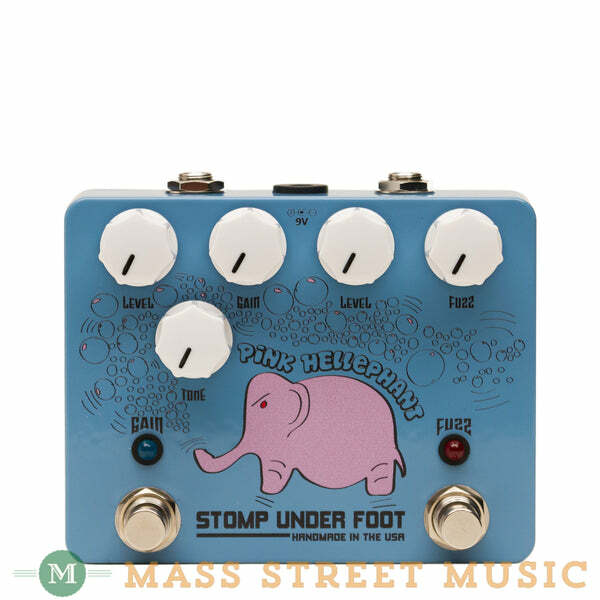 We did this custom pedal with the crew from Stomp Under Foot, and it is a really fun pedal. It has a Fuzz Face circuit and an Overdrive in the same enclosure. Both can be used individually, or you can stack them for over the top fuzz tones. The most exciting thing about this pedal is the spiffy elephant art work created by yours truly with magic computer help from Matt K! Don's guitars are always super consistent and a joy to play. Guitar to guitar, I haven't found one I dislike both in sound and feel. This one takes on an interstellar hippie look, but don't shy away from standing out. Ask us about putting together your dream guitar from one of the best builders in the world. The perfect couch guitar that is gig-ready for grab-and-go shows and coffee shop gigs. Classic look and feel with a fun vibe that just calls out to be picked up for a quick strum when you walk by (which is what I do every time I pass it!). It sounds sooo good, too. The total package! I tend to be a bit of a Luddite when it comes to technology, but I just started using this great little box. I like to record my own backing tracks for practice purposes and this thing fits the bill simply and economically. I plug my Rode NT-5 in and run a cable to my laptop, recognize it in Garageband and I'm ready to go. Great fidelity and easy to use. When I laid eyes on our first WL-14 in black I thought it would look so good with a tigerstripe guard instead of a cream one. It's taken a few years but now we have one! Every one of these we've had in has been a great banjo. This is the same model I play, and I've been extremely happy with my banjo over the last few years. Great build quality, with quality woods and a thin lacquer finish, at a great price. I particularly enjoy the enhanced depth and resonance the 12" pot delivers. This Eastman MDA315 Mandola is almost too much fun! Extremely nice build quality with this all solid wood instrument. Great for taking leads, or playing rhythm, giving your fingers a little stretch. I love a good, low end bark on mandolin, so this mandola is especially fun with the open low C growl! Really fun!! Love these new Classic Series models from Fender, with all nitro finishes and some vintage style specs. Great price for a new, vintage-style, Fender. I've picked Strats like this before, but I really like the Woodstock Hendrix White Strat look, super sharp goes great with a tux, or anything really! A part of the new players series that we just got in, the pickups are the new alnico pickups and they sound great. We've got them in store and they'll up on the website soon. Come check this affordable Strat out! I've been so impressed with each one these JL series guitars that we've been getting from Collings. So much so I'm thinking about buying a 1 3/4" version for myself. 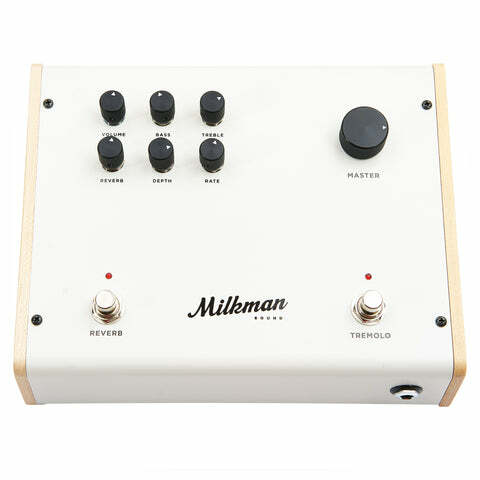 All of the milkman amps that we have had in have been great, but the creamer is my personal favorite. It is has enough headroom to gig with, but with the built in attenuator it can breakup at very comfortable volumes. Also the reverb and trem sound amazing in this amp. I have really been digging the new V-Class since our Taylor Road show earlier this year. I recently got to attend Taylor University in Denver, CO and was able to dive into the bracing a little more and hear from different Taylor people and other retailers, and I believe the hype. 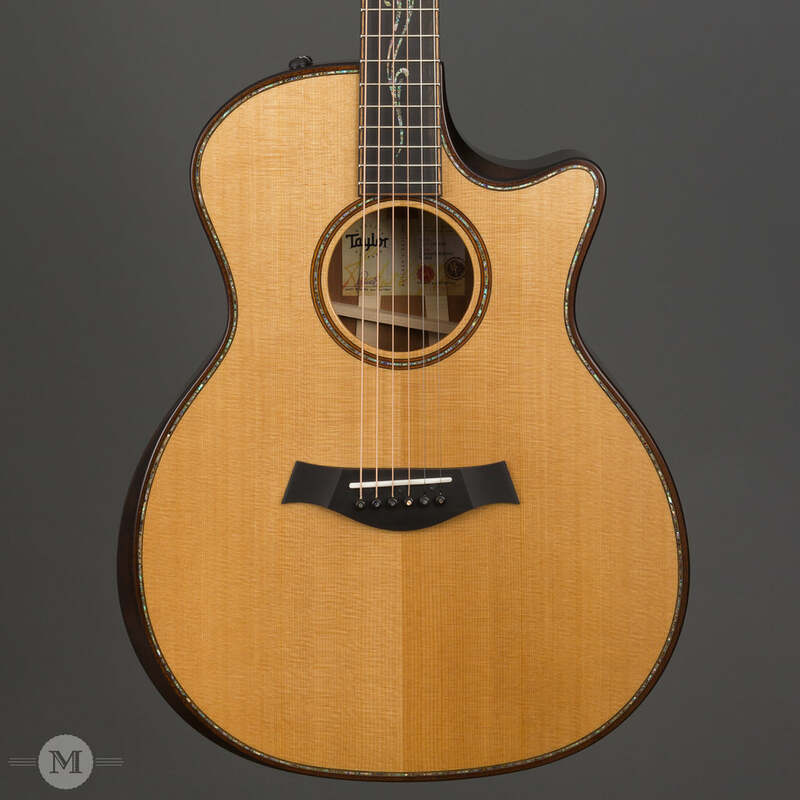 I think this guitar solves a ton of intonation issues inherent with guitars, and further pushes the richness and consistency Taylor is known for as a manufacturer. I'm impressed, and I want one. I've always enjoyed this compressor on my main electric board, but have recently become even more impressed by how it performs in my acoustic rig! I set the toggle switch to "Lo" so it's not adding a lot of compression - just enough to even things out and make the feel of the strings more natural under my fingers while using the piezo pickup in my guitar. Such a versatile tool to have! 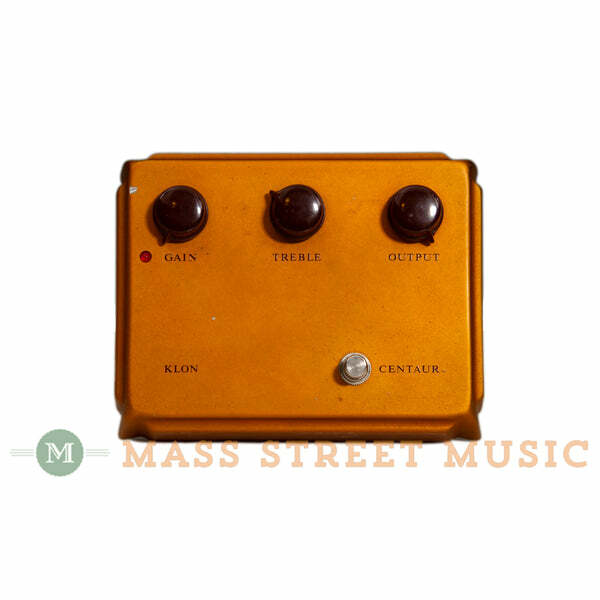 Check out our collection of in-stock Effects Pedals! 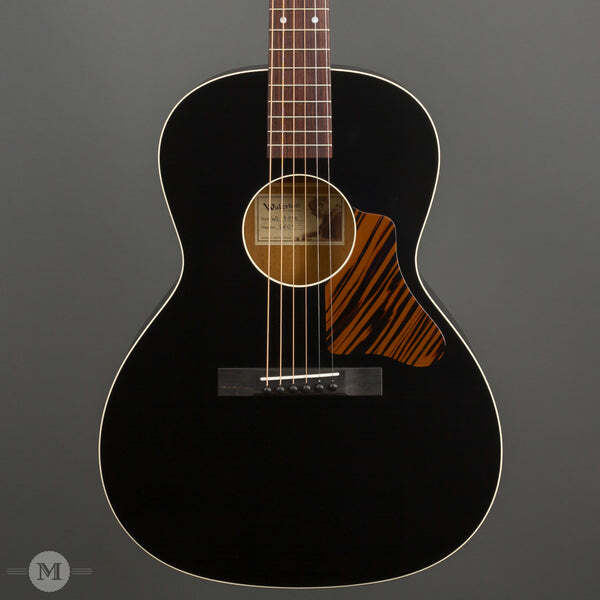 These Adirondack models continue to be consistently great guitars. Fantastic bluegrass models. I've been on an Anderson kick for the last 3 months and this used classic comes in at a great price and has had the pickups changed out to Fralins which is perfect in my opinion. Check out our Collection of Martin Guitars! I love these Gretsch Honey Dipper guitars with the Shed Roof finish! They sound so rich and full, and they have a lot of punch. Plus they look amazing, and our shop can set it up for whatever playing style you prefer! This was a new leap for us with Collings. With tonewoods like Madagascar becoming hard to find, we wanted to try a new alternative. We found that option in Wenge, or African Rosewood as it's sometimes called. This wood has been used on our favorite CJ-35s for the bridge and fingerboard for years, but we hadn't tried it as a back and sides. I'm so glad we did. This guitar keeps delivering. I've played it a little bit every day since we got it last week and I can't believe how open and robust it's getting. Don't miss out on trying this little 002H. Tons of great Acoustic Guitars in the shop right now!